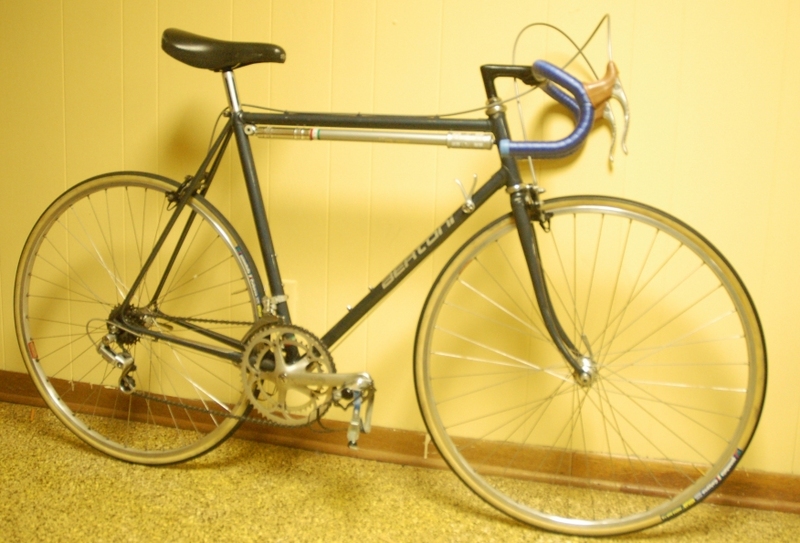 Never having been a huge enthusiast to British machinery it has occurred to me that having an interesting Raleigh road bike in the museum would be nice. 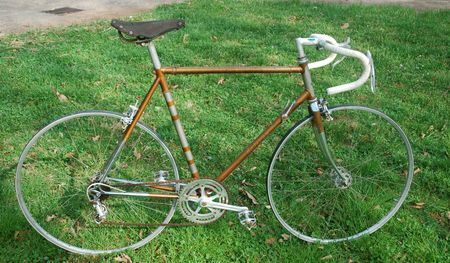 A week does not go by that I don't see a Grand Prix for premium money or some interesting looking Super Course or even, most recently, a very nice looking Gran Course for sale. 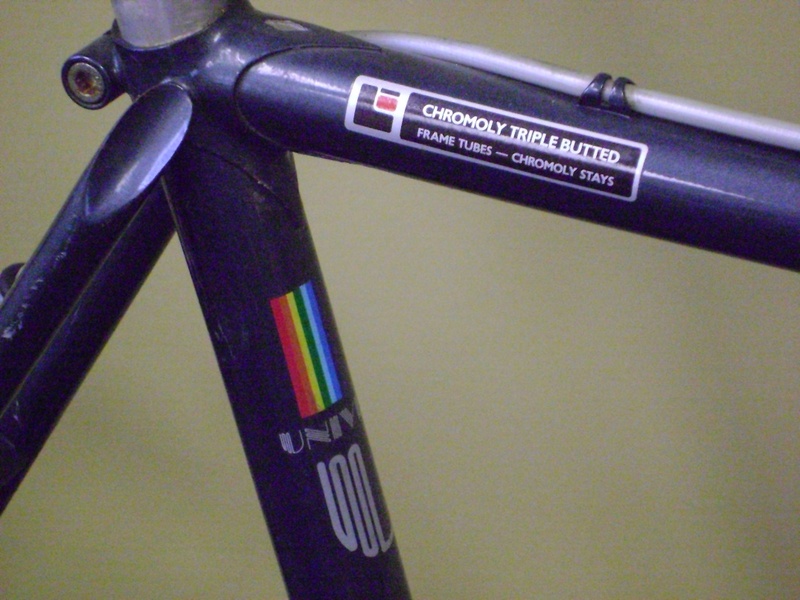 Then, this one came along and looked very interesting (on a lot of levels). 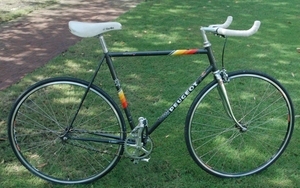 The Professional was described as Raleigh's nod to Italian bike design and the construction, group selection (Campagnolo Nuovo Record) and aesthetics reflect this. 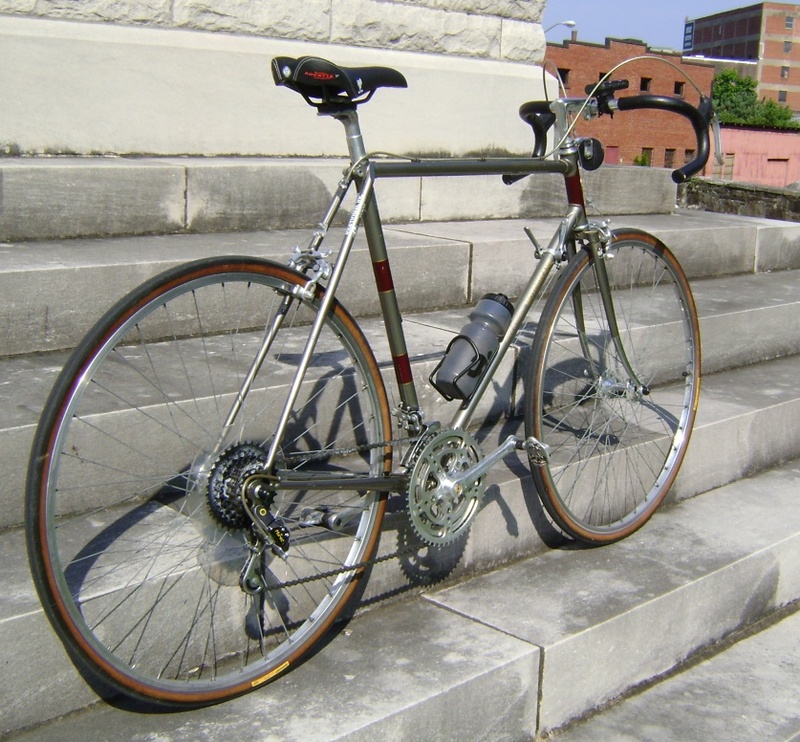 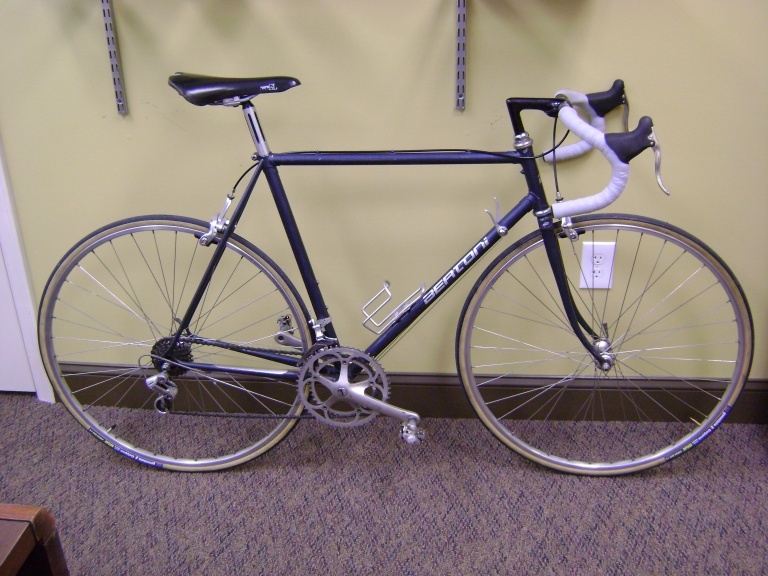 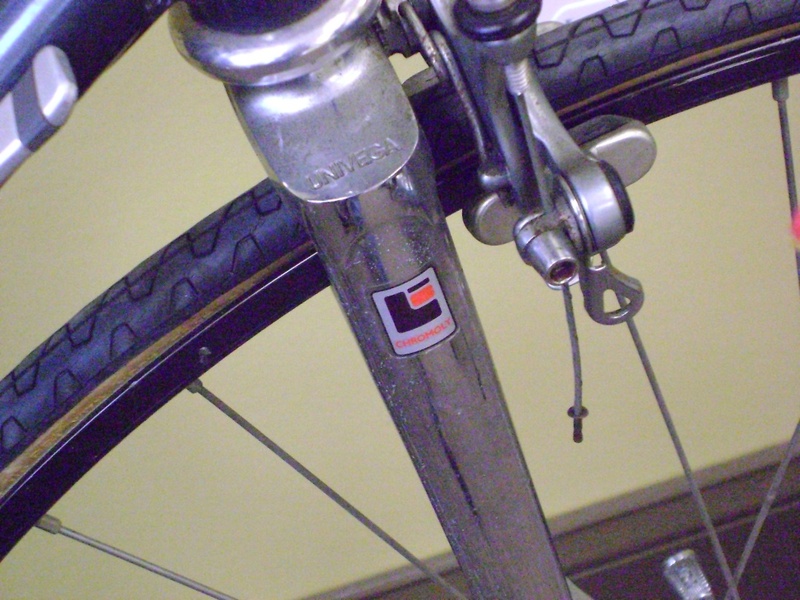 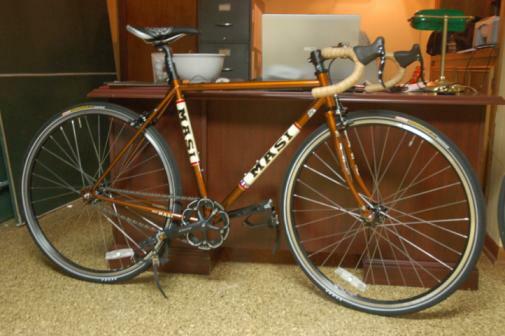 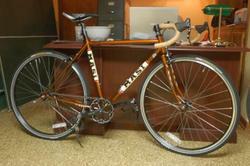 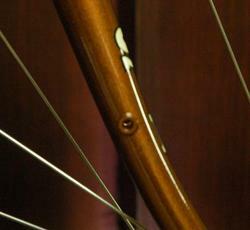 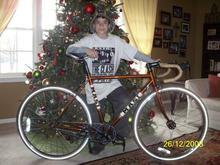 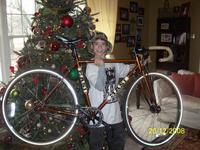 Unlike it's Italian counter-parts, it is constructed using Reynolds 531 double butted tubing. 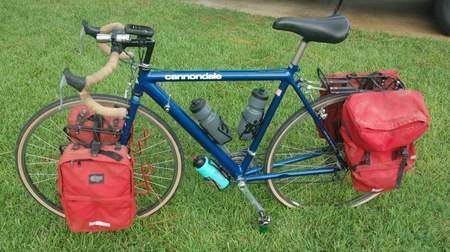 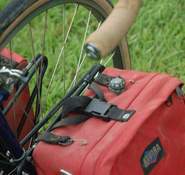 As with most things bicycle, Sheldon Brown compiled some excellent starter resources to learn about these bikes and they can be found here. I like a good challenge, and contrary to the typical fare of bikes in this condition that float around waiting to be turned into recycled steel, this one looks like it may be worth the effort to bring back to life - and it's exactly my size! For now, here it is in it's "as rescued" condition. 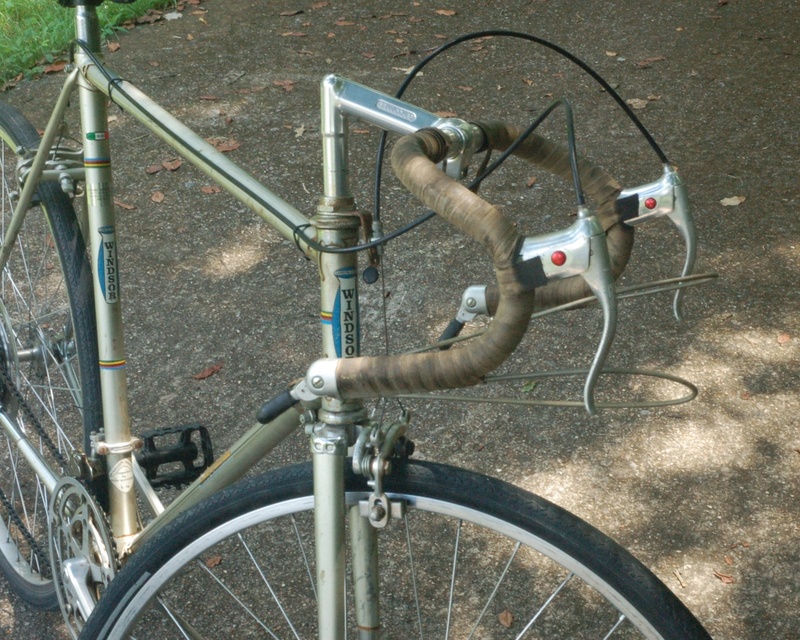 It appears to be complete less a few cables, hoods, for the brake levers (should it have hoods? 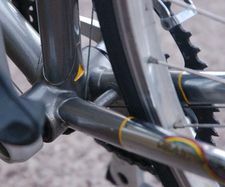 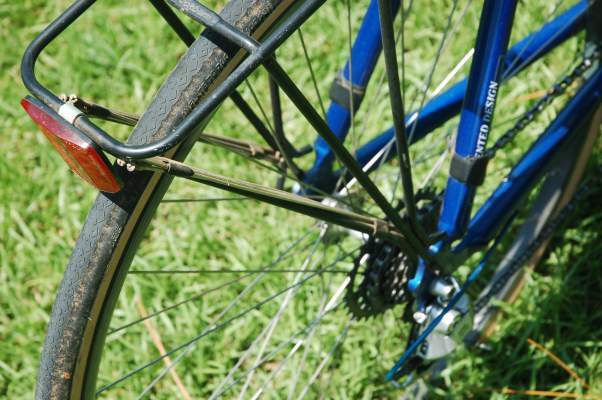 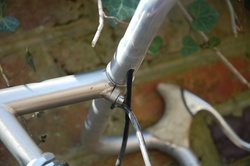 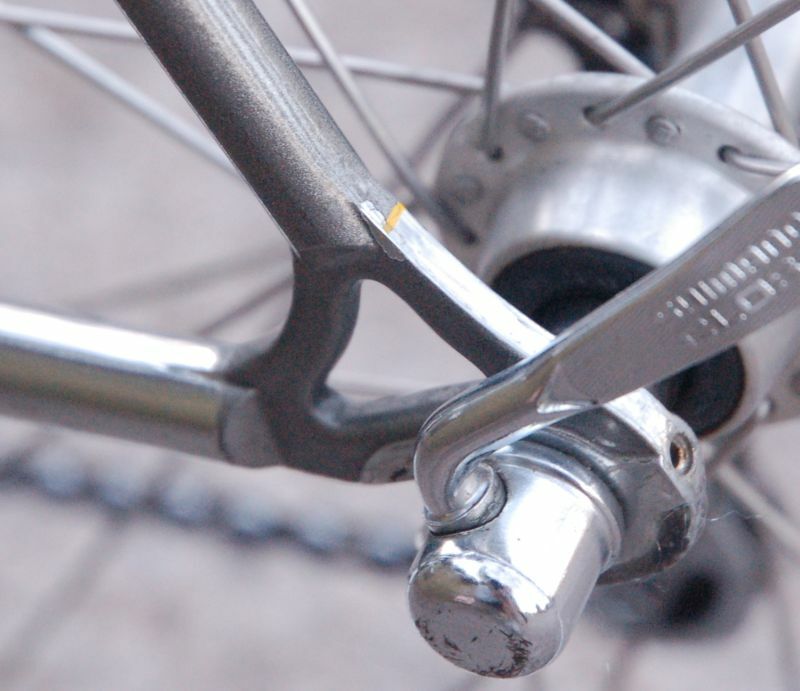 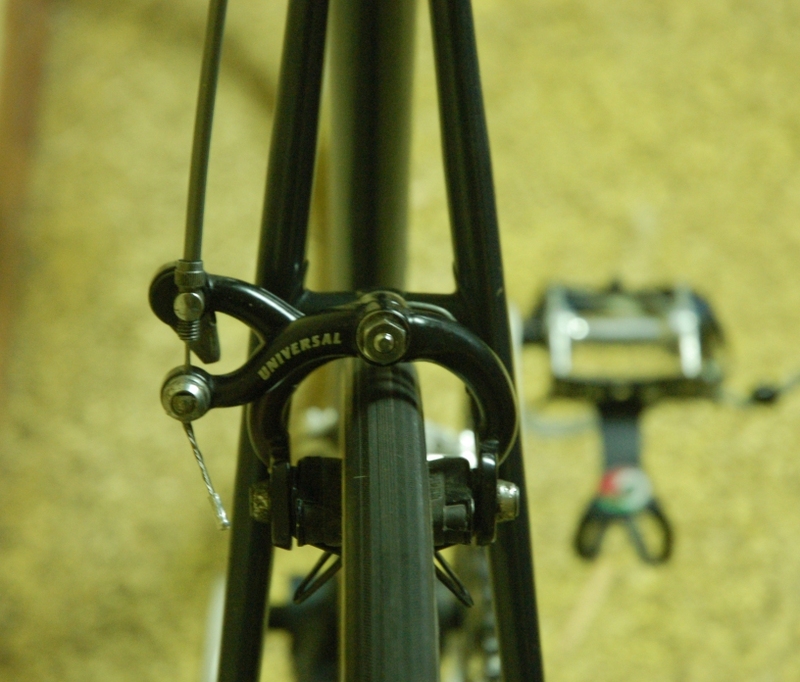 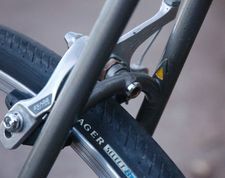 ), one cable fastener for the brakes and the front derailleur. So, I guess that means I should add here that I'm looking for an early '70s Campagnolo Nuovo Record front derailleur and possibly some brake hardware for Campagnolo of the same vintage. 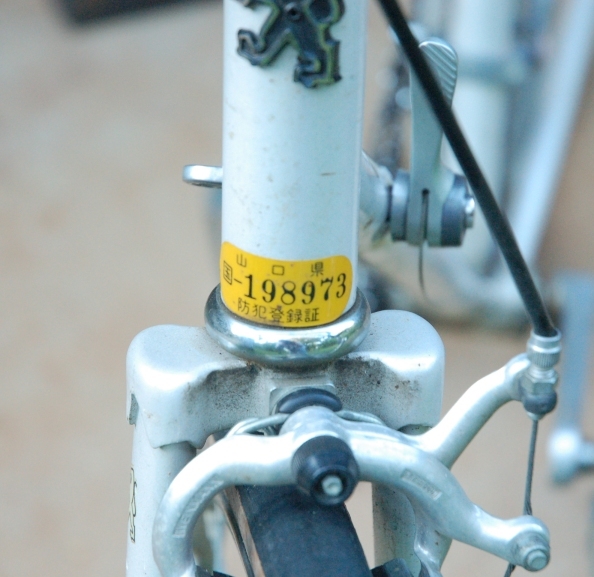 The serial number on the bike (stamped on the bottom of the bottom bracket) is F5598 and I am under the impression it is a 1970 model. 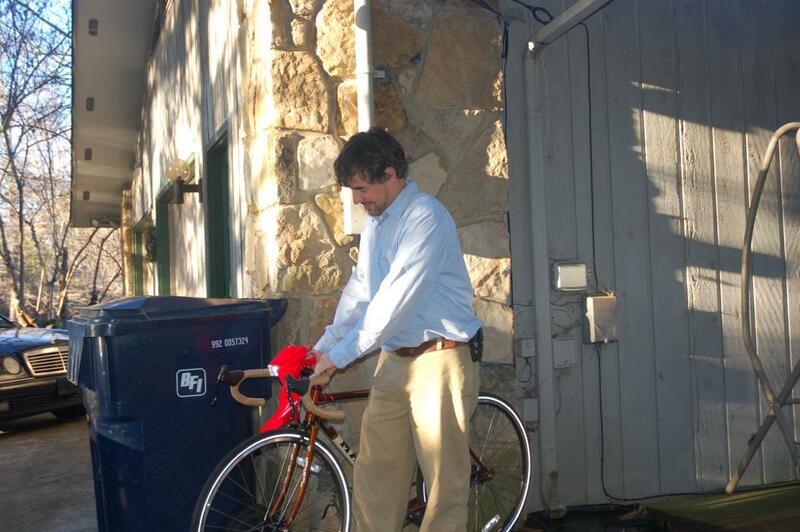 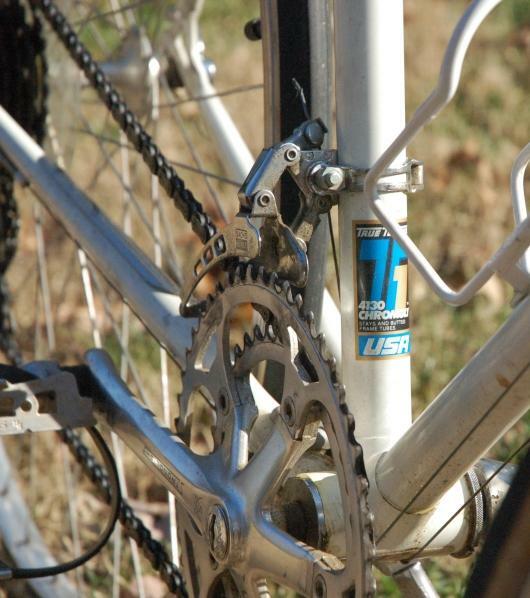 I think that photo was taken after i cut off the rusty chain with bolt cutters and probably while I was in process of using the same method of removing the brake and derailleur cables. 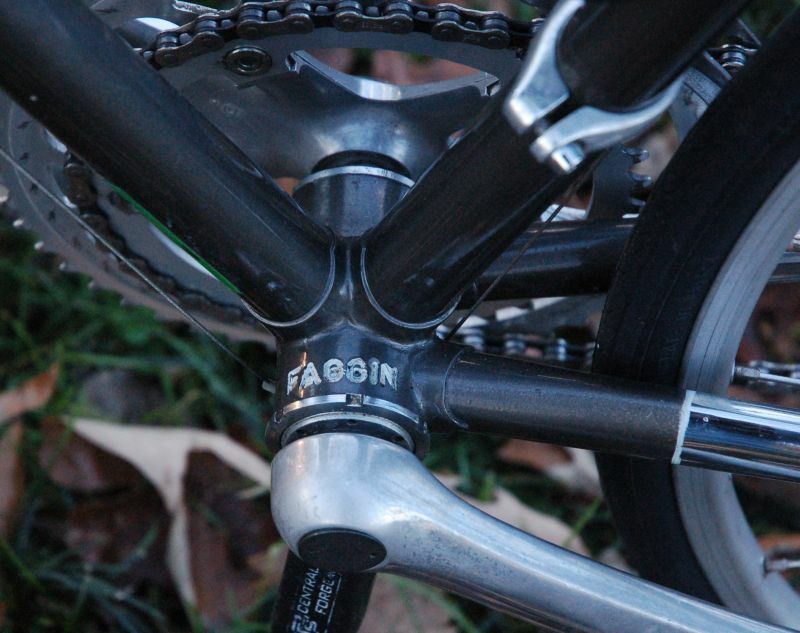 The bottom bracket was super-notchy feeling, but surprisingly enough the axle races and cups were not really bad. 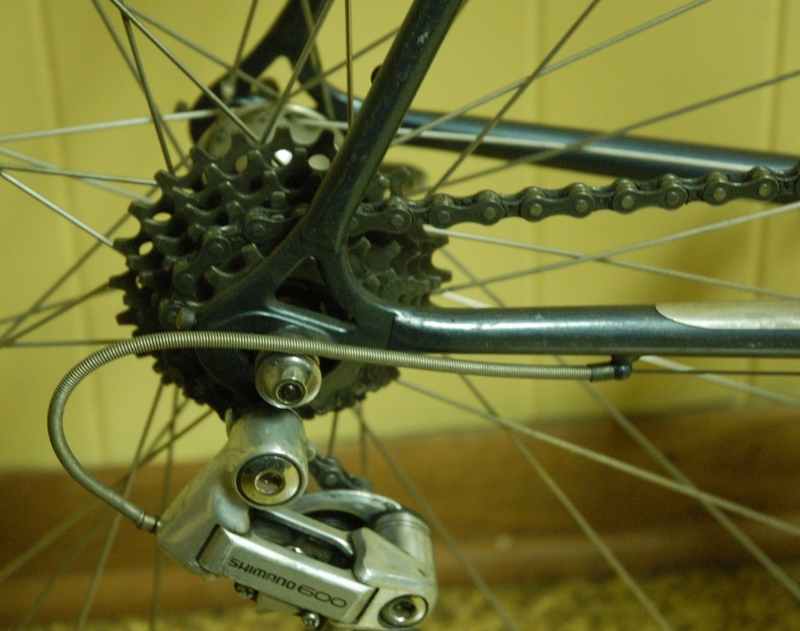 The headset was fine but the wheel bearings will need to be repacked before they can be put back into use. 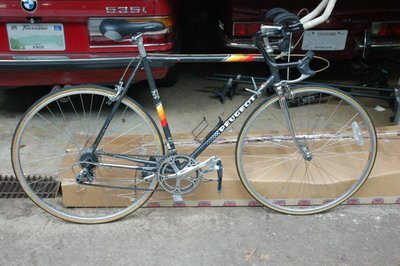 The wheels were take-offs from someone's "plastic" road bike, the tires, tubes, and fork were on another bike I had (1" threadless steerer). 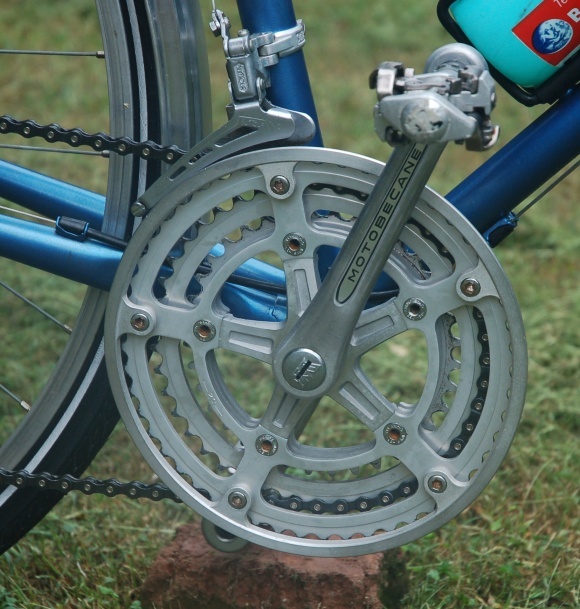 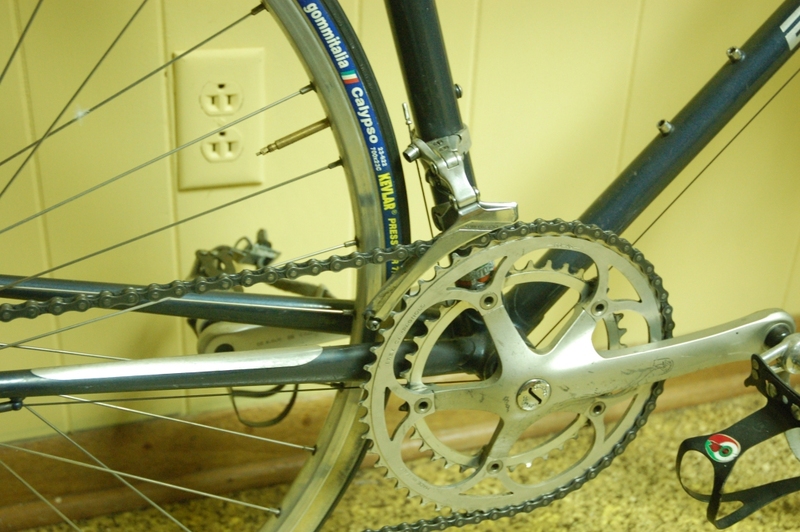 The drivetrain is a compact double (Campagnolo Veloce) 50/34 crankset matched with a 9 speed rear end with a Shimano Tiagra rear derailleur and brake/shifter set (I know, I know....but the shifters had been pronounced dead & I brought them back to life). 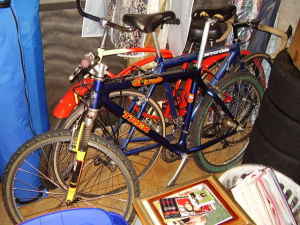 The bars and seat were general shop fodder. 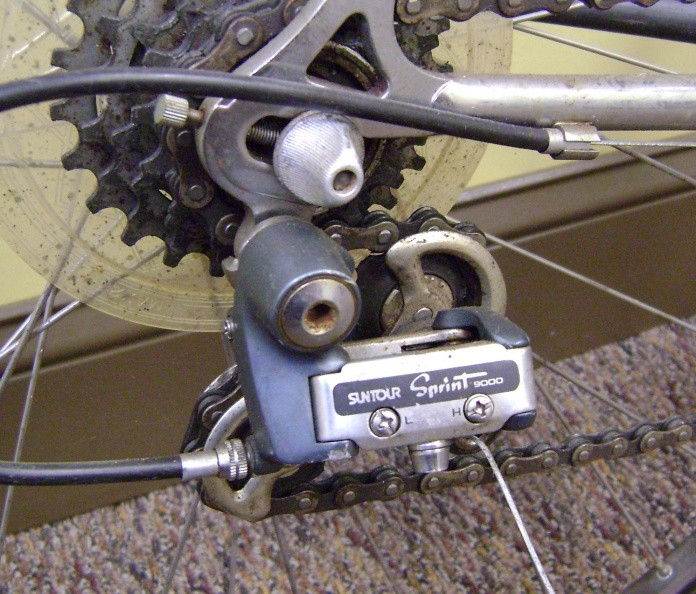 The pedals were among a group of old Look pedals I picked up from a parts bin at one of the local shops. 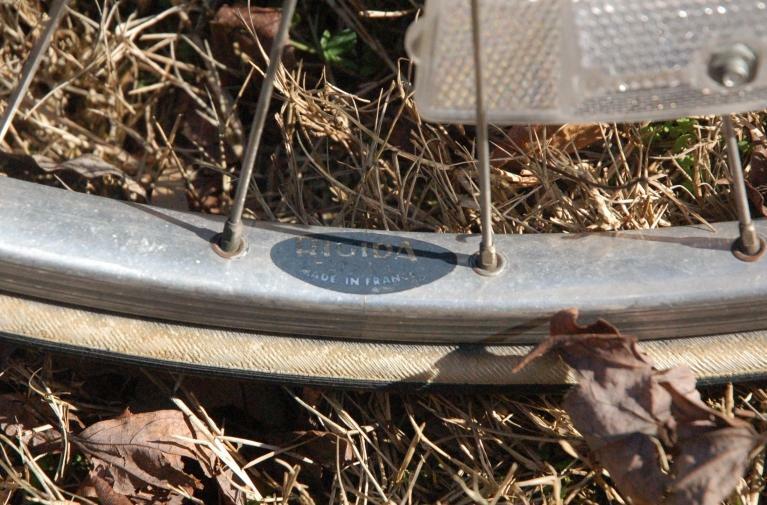 Oddly enough, perhaps, I have something like 10 sets of pedals that use these cleats. 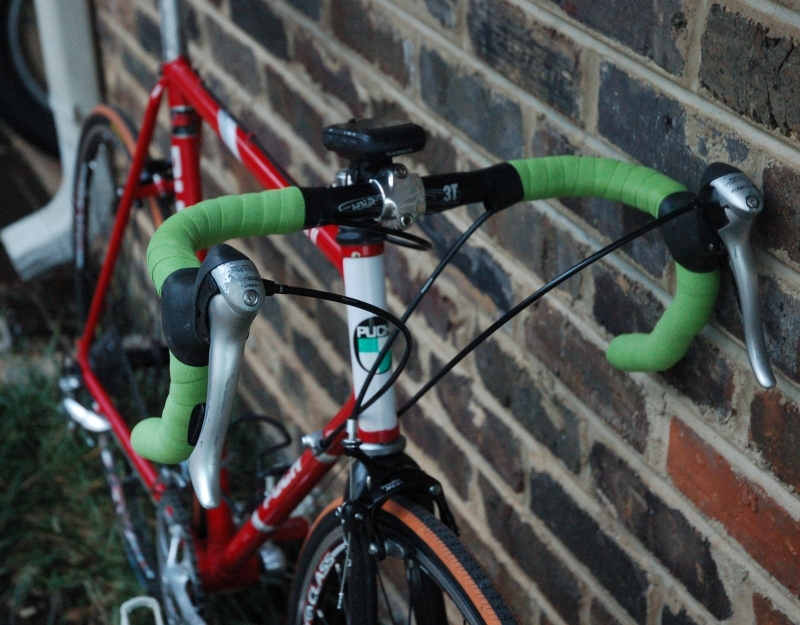 With my interest in trying out different setups (thus the compact crankset), I also tried a rather narrow (compared to modern standards) bar width matching my shoulders a bit more precisely than the wider bars I usually see on modern machines. 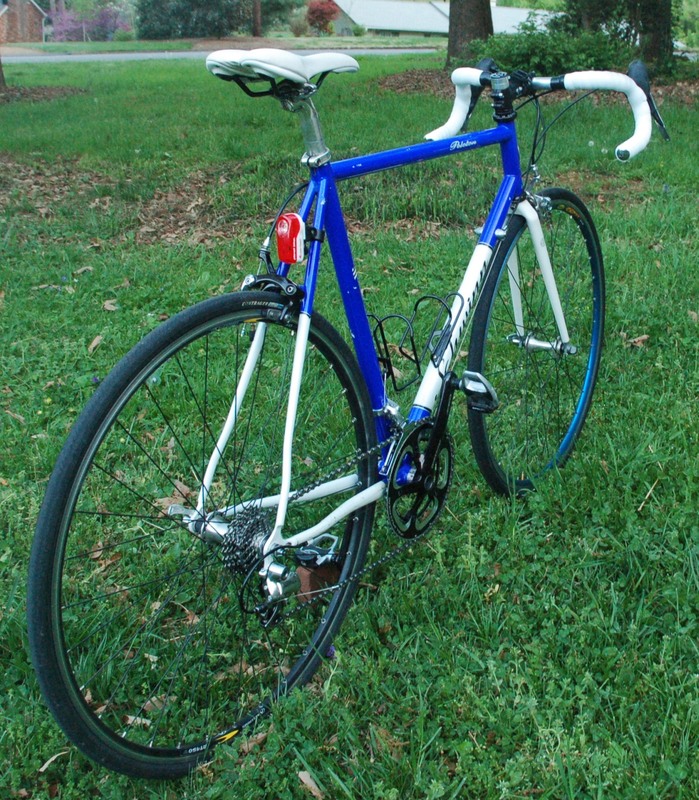 All in all, it turned out to be a nice ride. 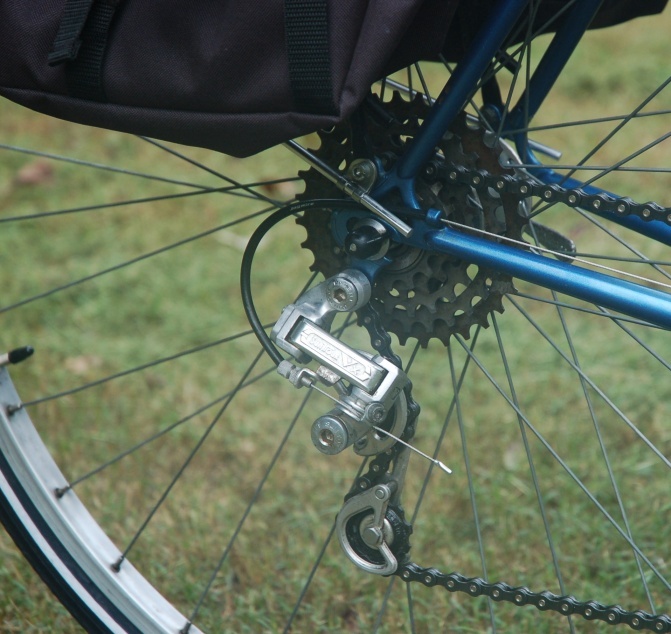 I'm not convinced I like the compact double setup, but it is certainly a different - and perhaps more efficience in terms of gear ratio duplication - experience for me. 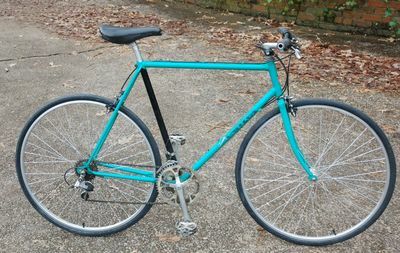 Here are a few more pics of the build. 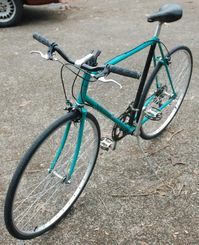 This is the latest museum addition. 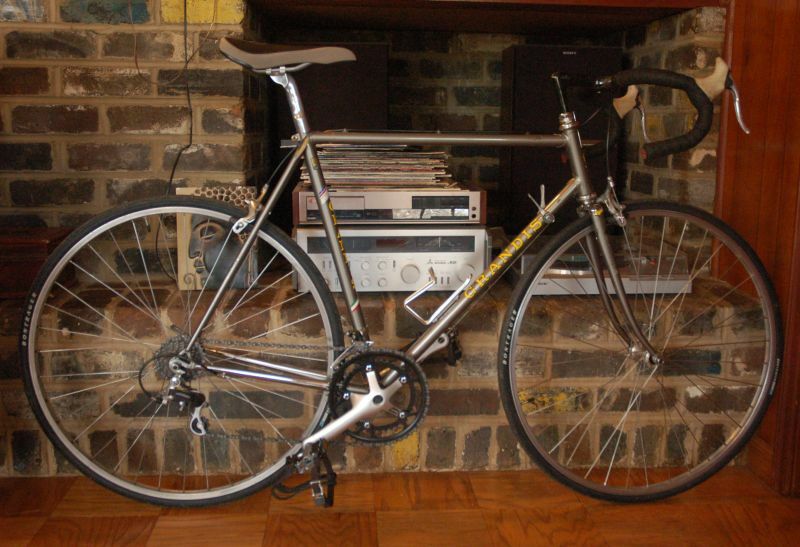 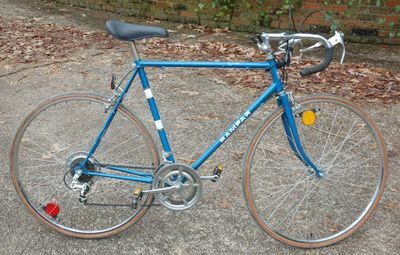 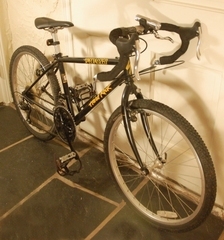 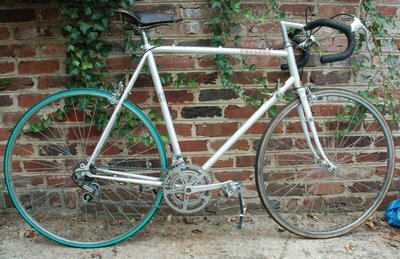 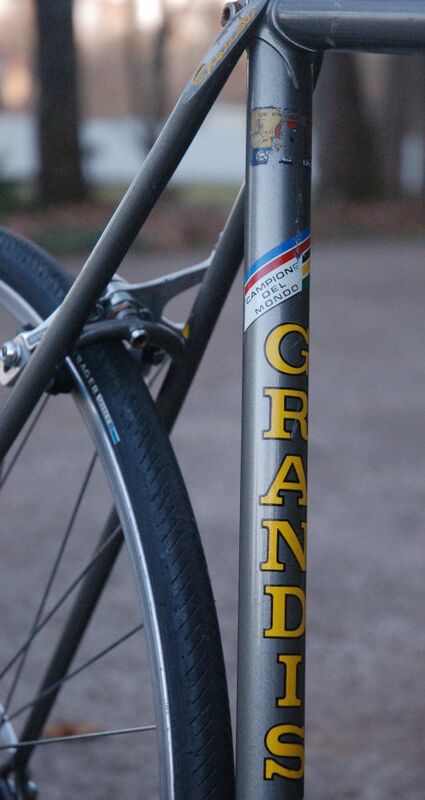 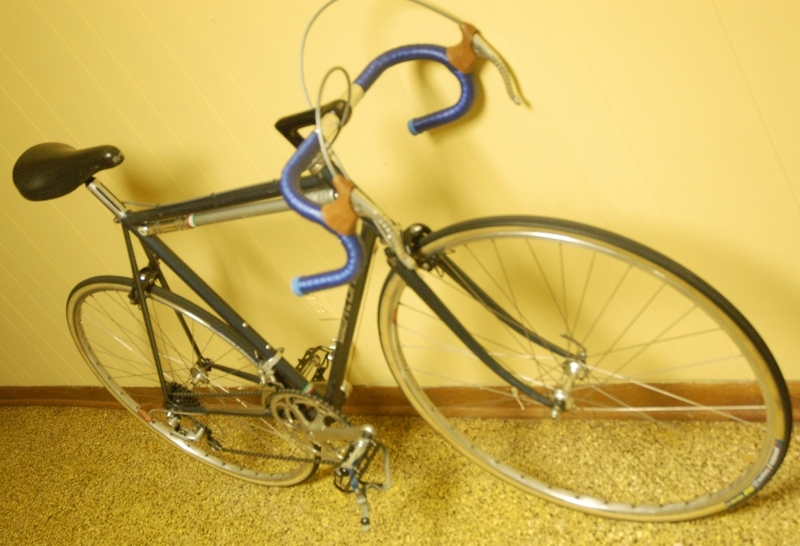 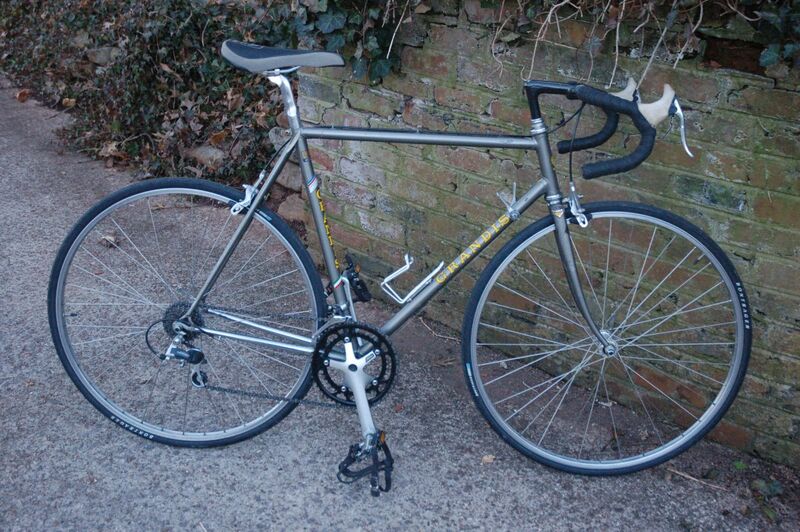 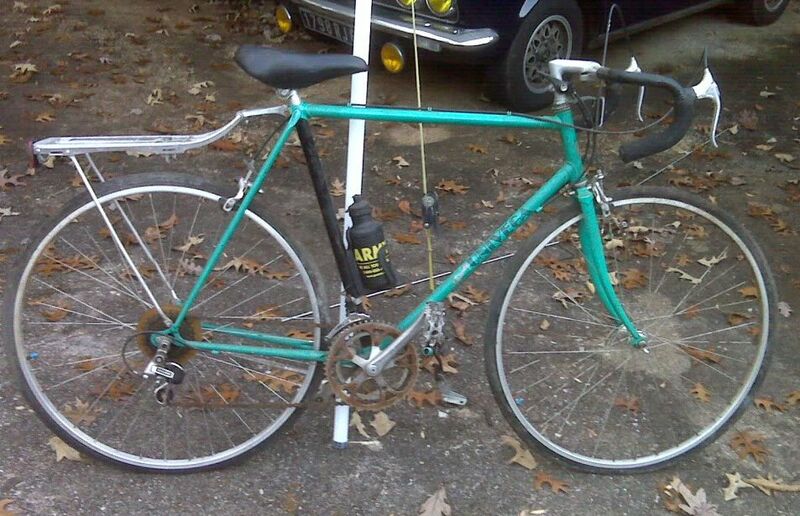 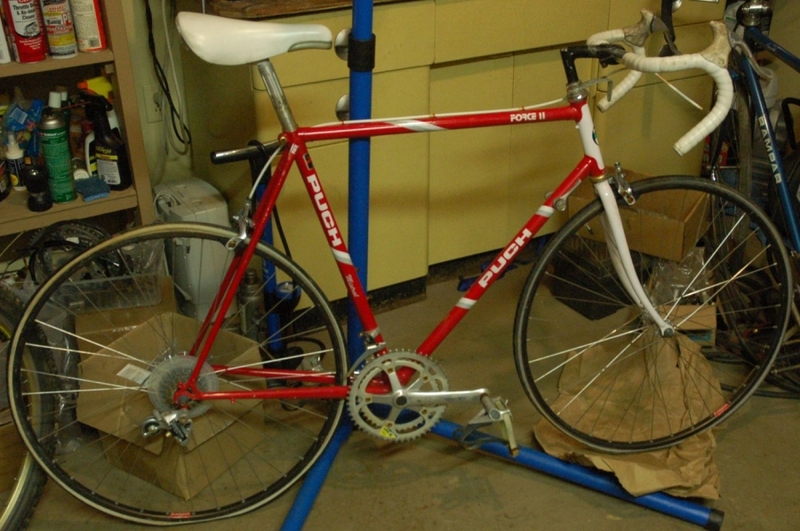 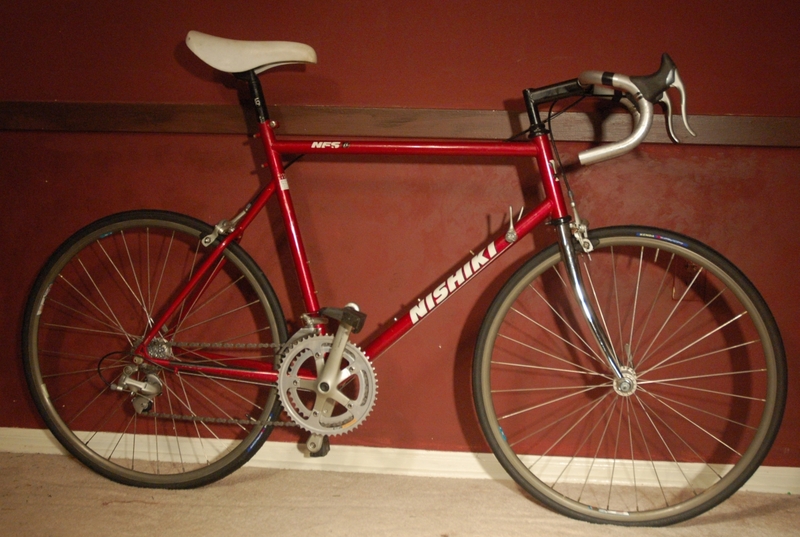 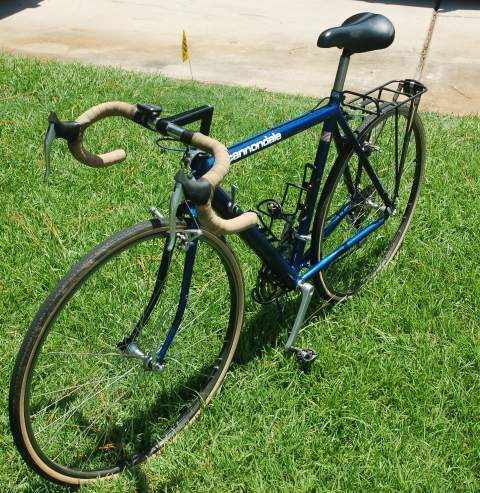 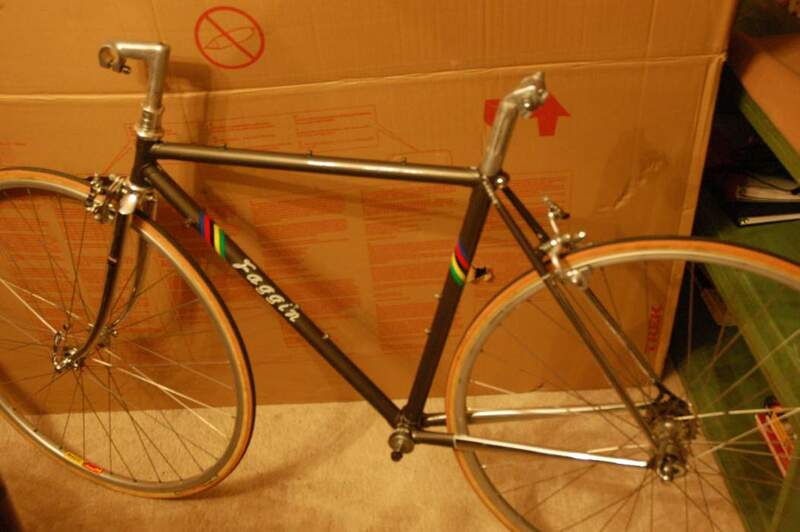 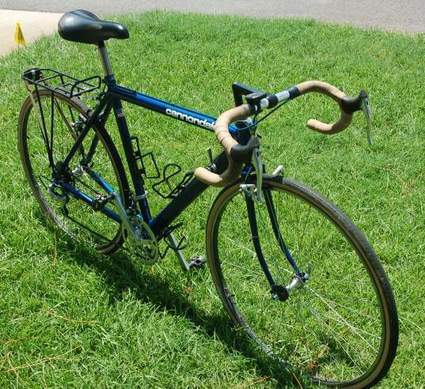 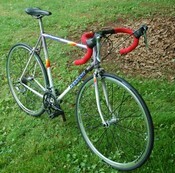 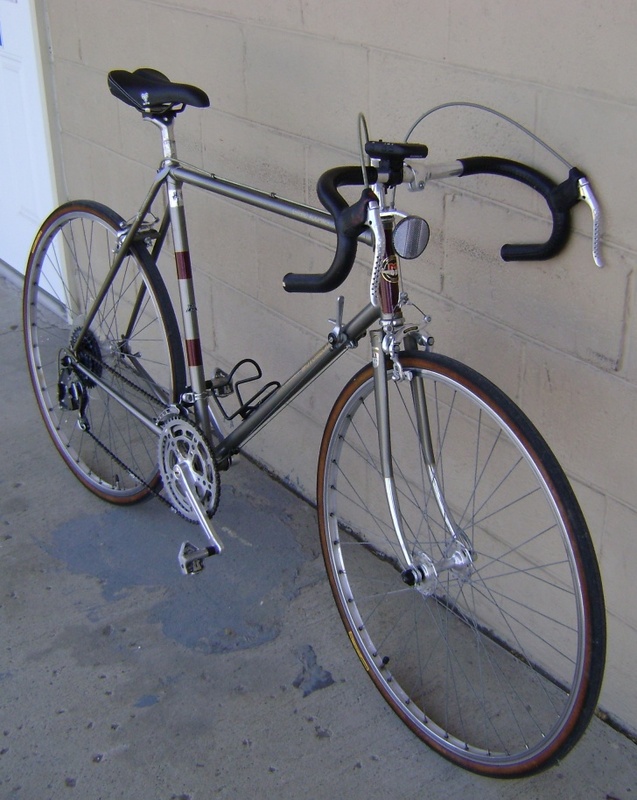 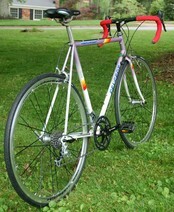 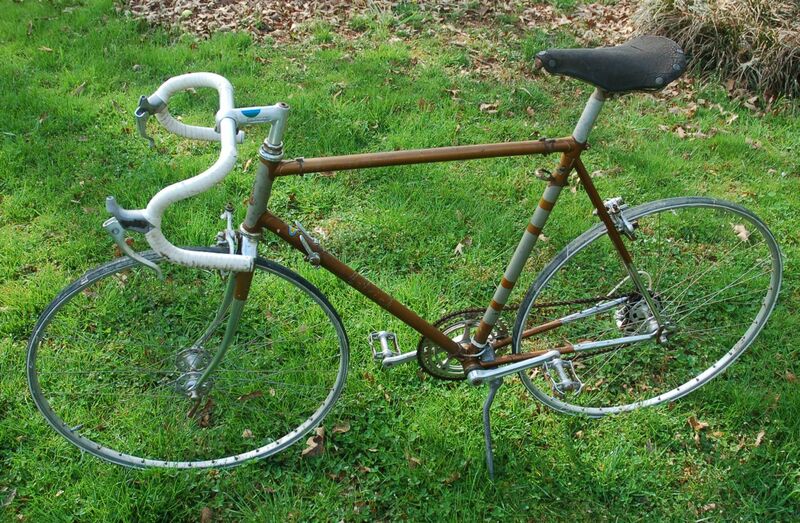 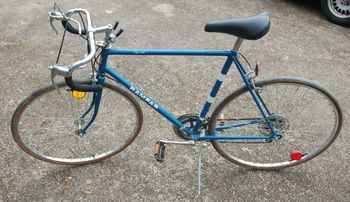 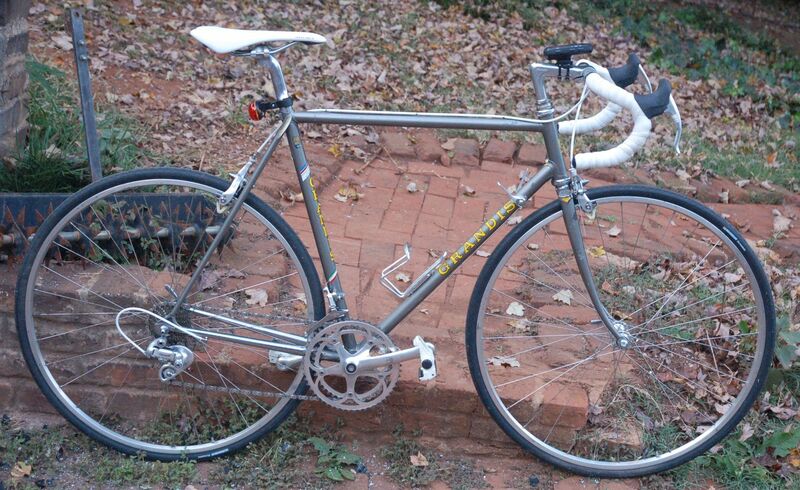 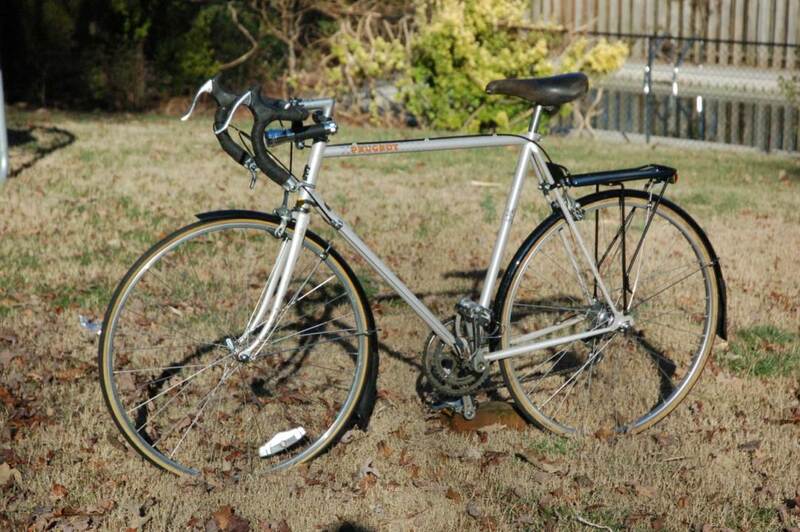 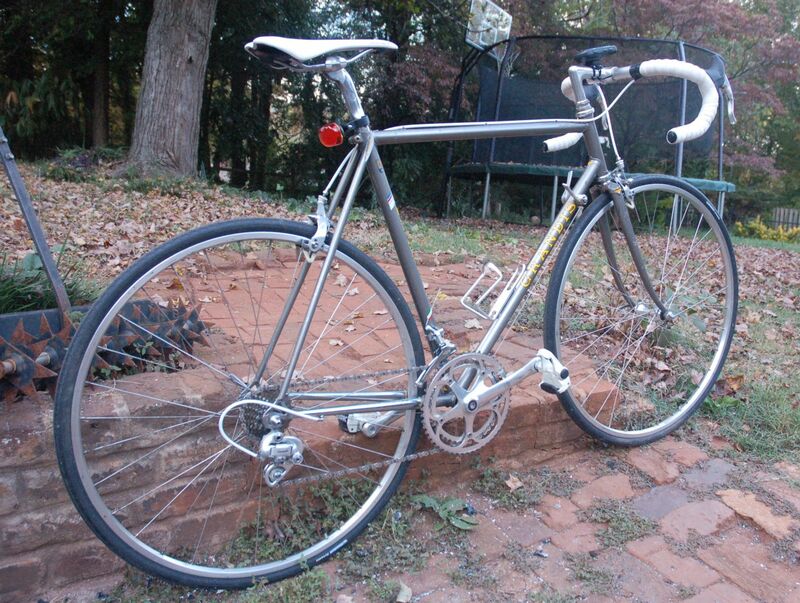 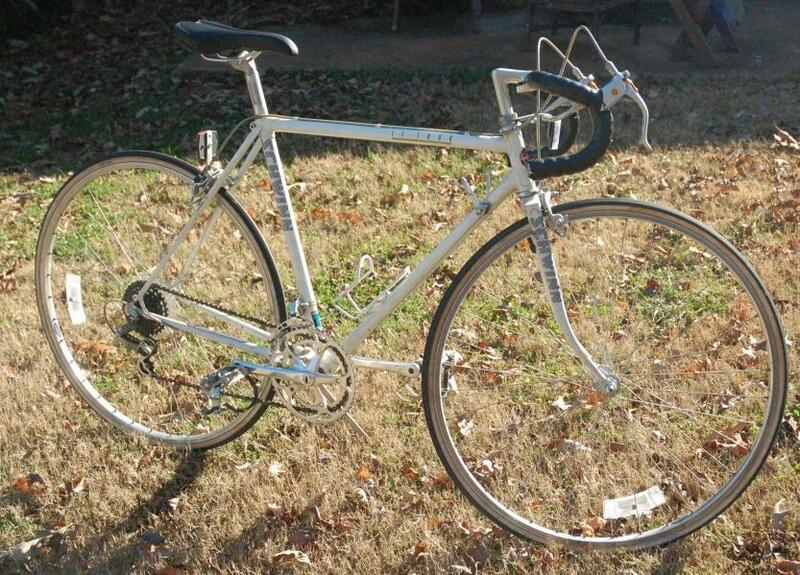 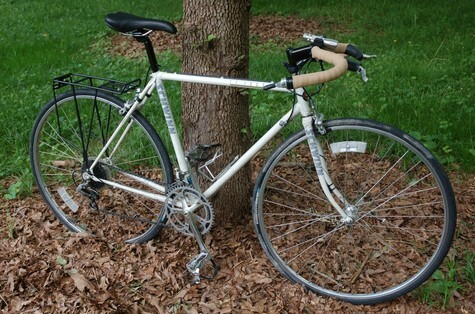 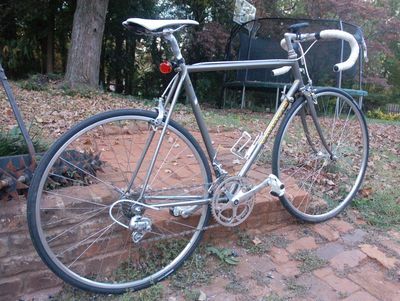 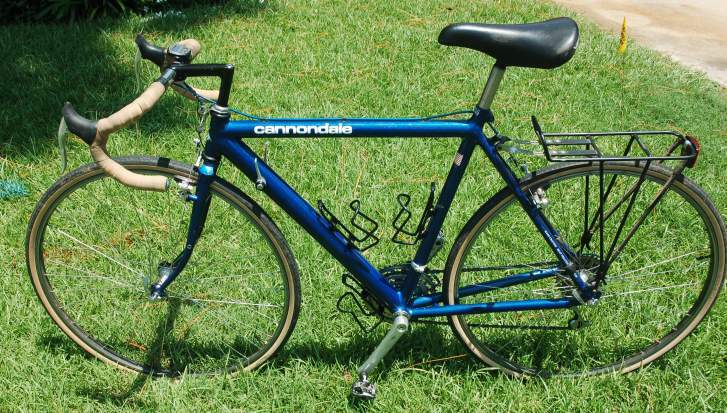 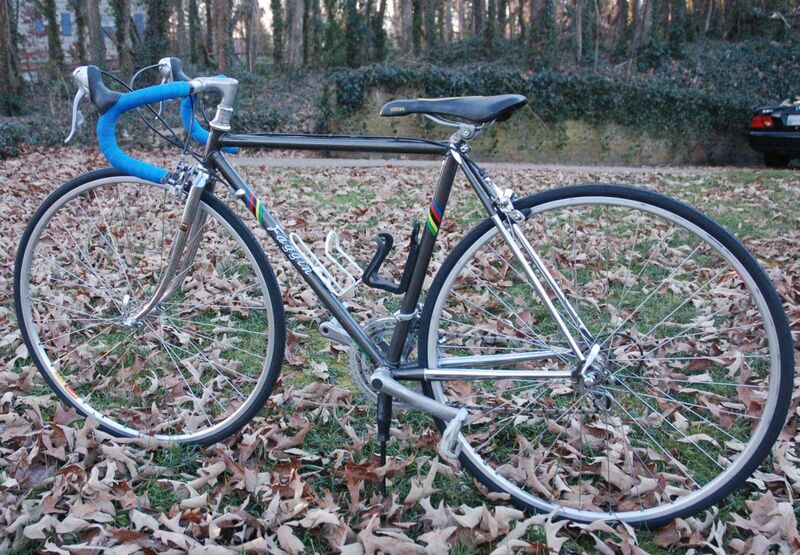 This is what i believe is an early 1980s Grandis road bike. 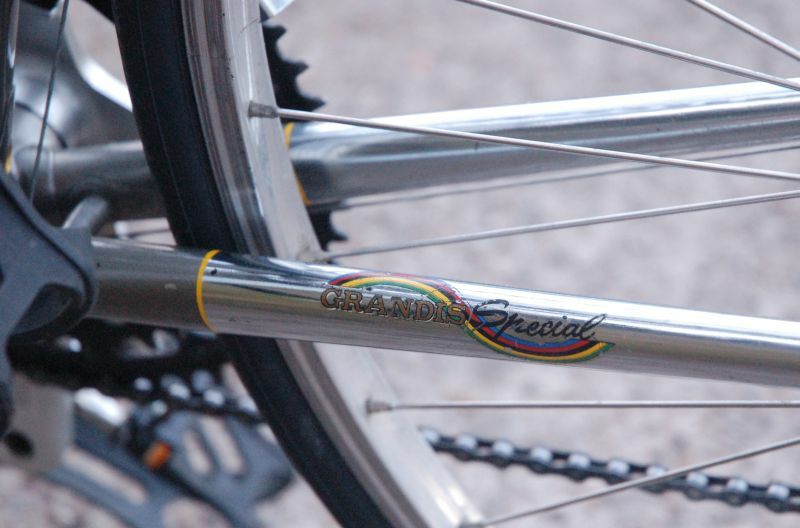 Grandis is an Italian bike maker who only imported to the US in relatively small numbers, apparently during the late '70s and early '80s. 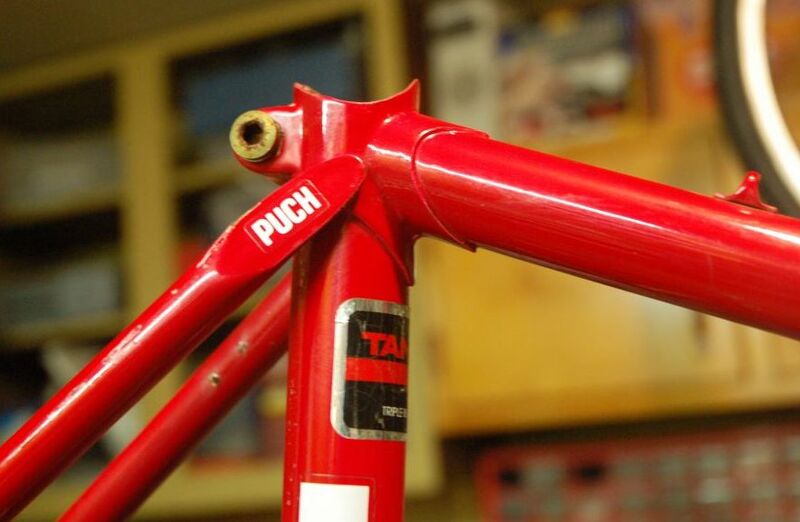 The company is still alive and well, but is no longer importing to the US. 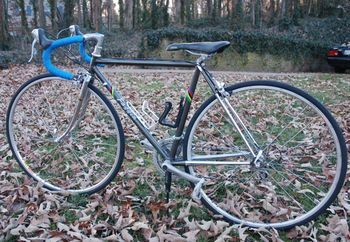 The bike was originally a completely Campagnolo-clad machine built on a highly detailed (but tastefully done) lugged Columbus steel frame. Almost all the Campy was gone by the time this fine machine was added. 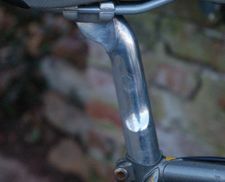 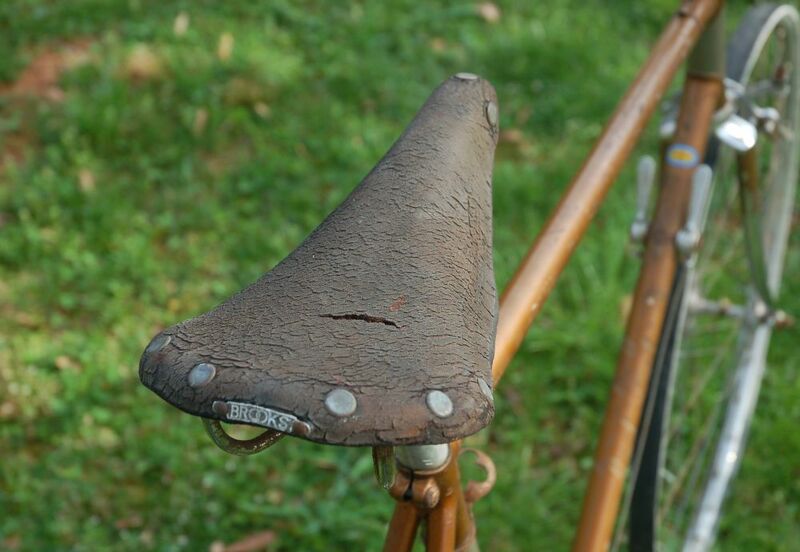 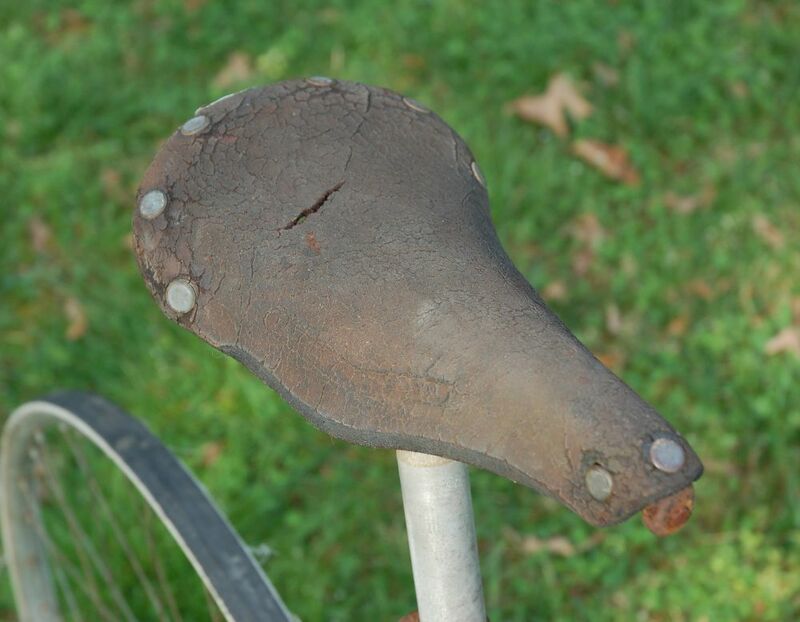 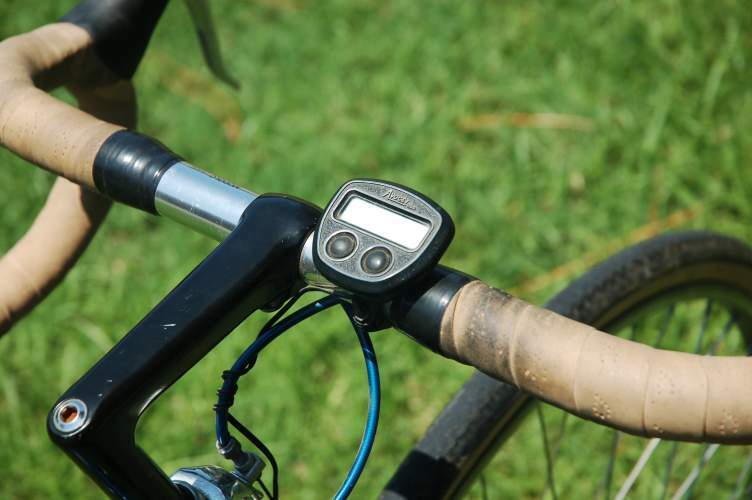 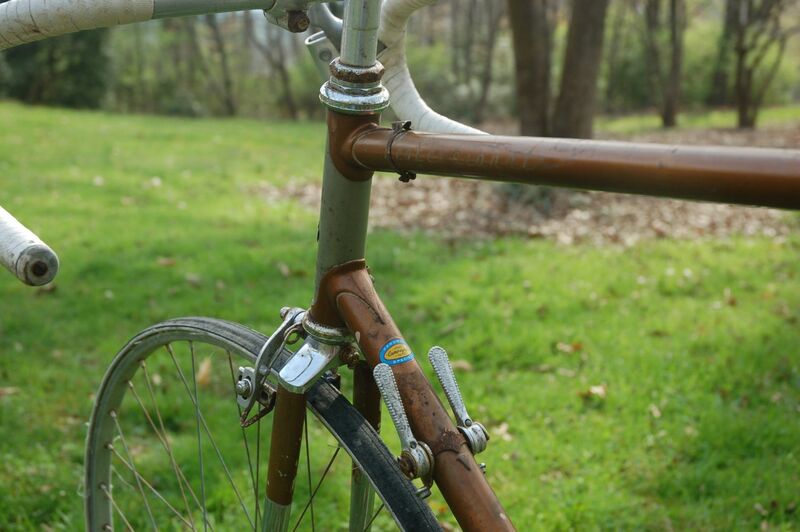 Currently, it has it's fair share of scratches and general "patina" - which is fine, but all the components except the seatpost have been replaced some time in the past with a Shimano Exage group. 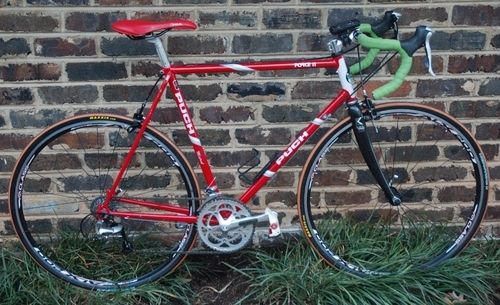 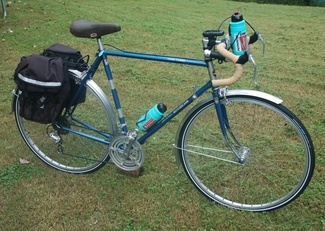 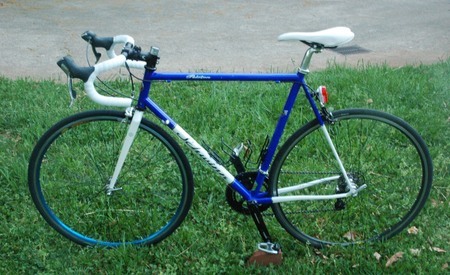 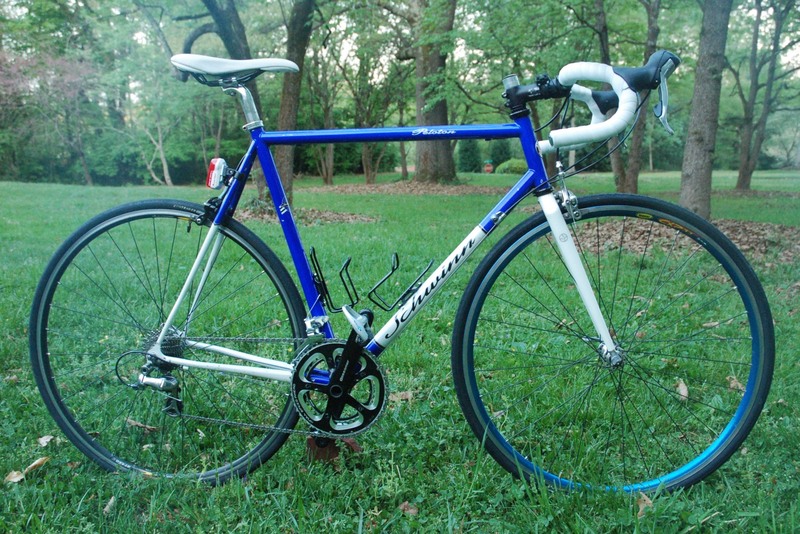 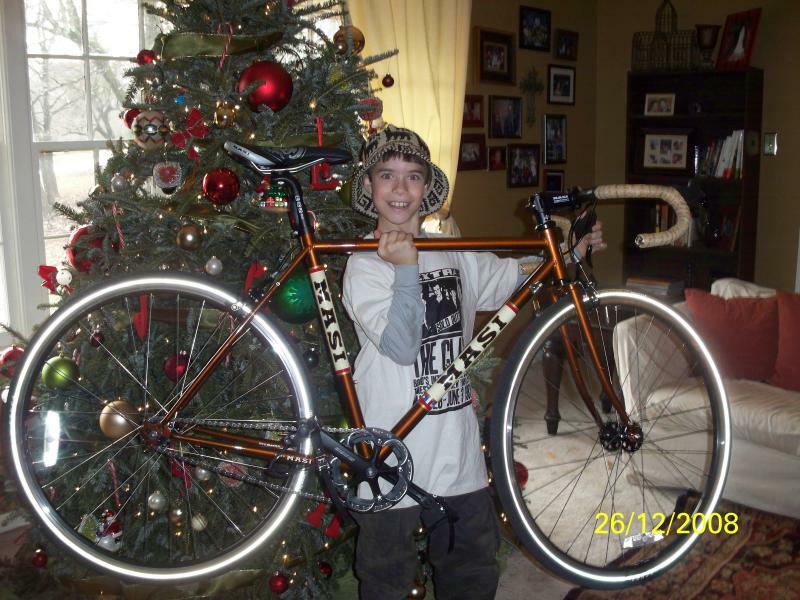 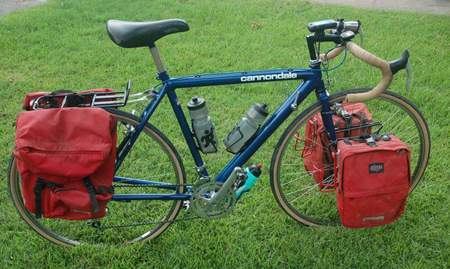 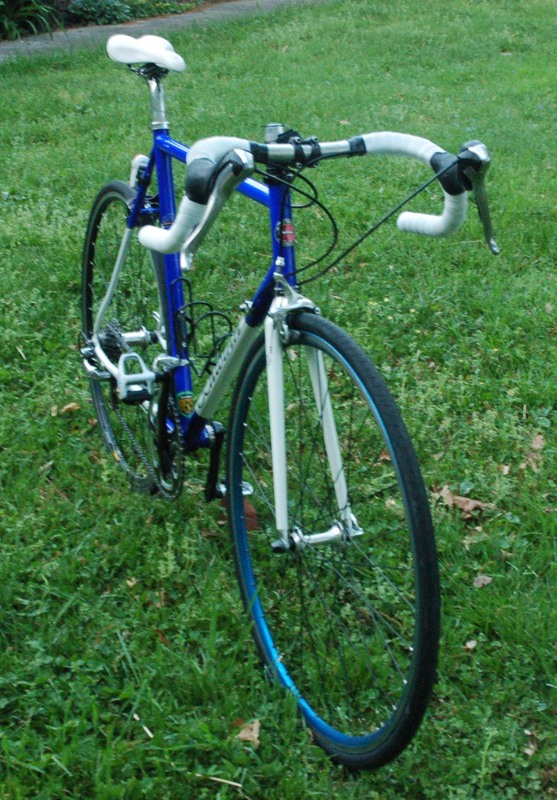 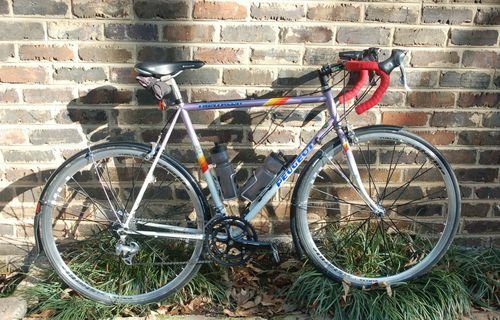 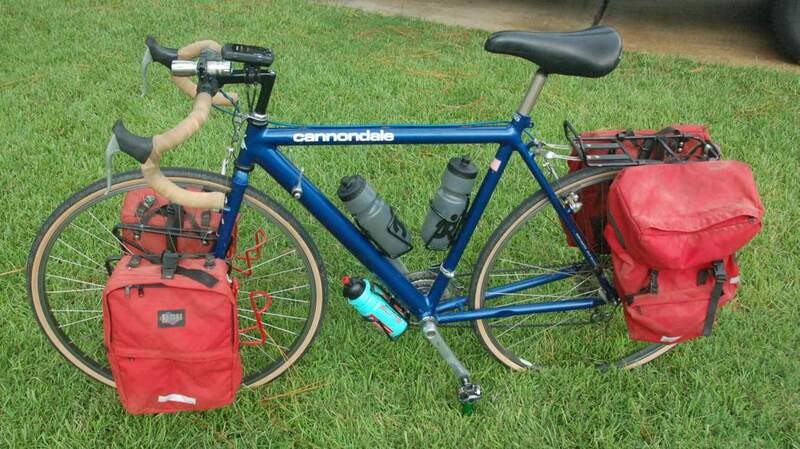 The upshot is that the bike arrived in the condition shown, with new tires, new bar tape, and mechanically ready to ride. 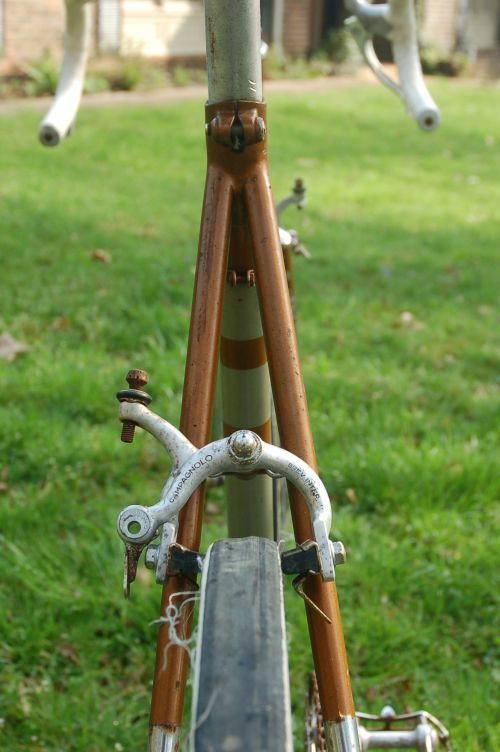 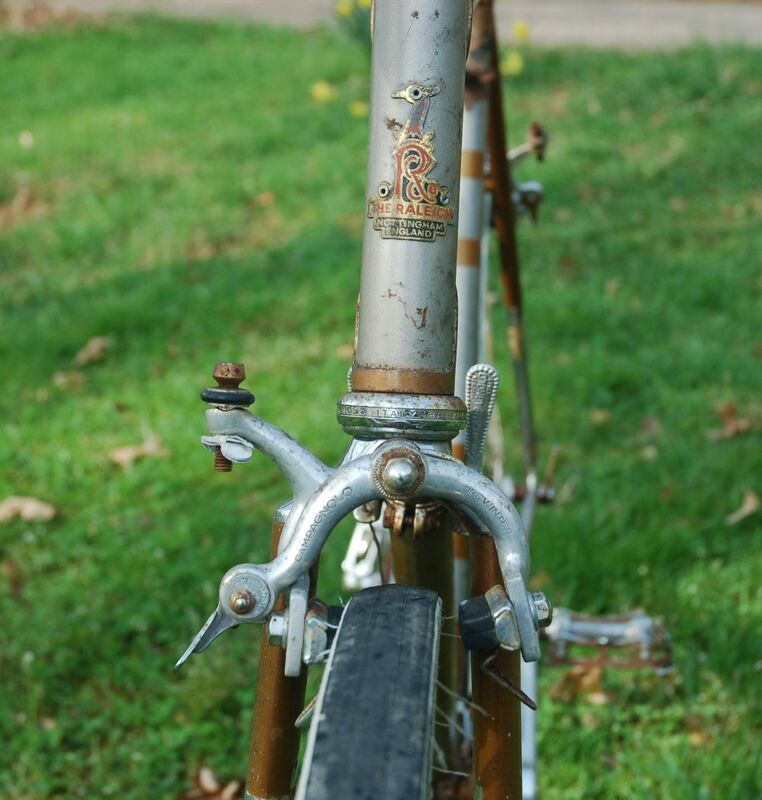 I hope for this to be a slow, period-correct and tasteful (er, as opposed to some of my other works) restoration to the Italian glory this bike was built for. 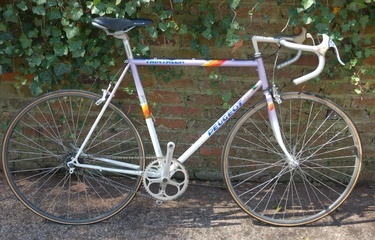 I thought I'd put some photos up of the Le Tour. 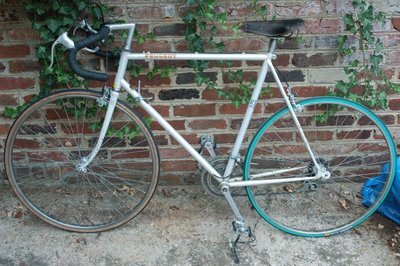 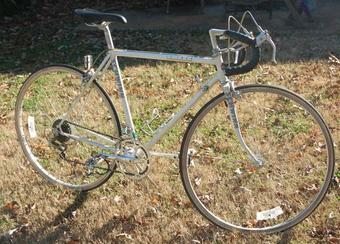 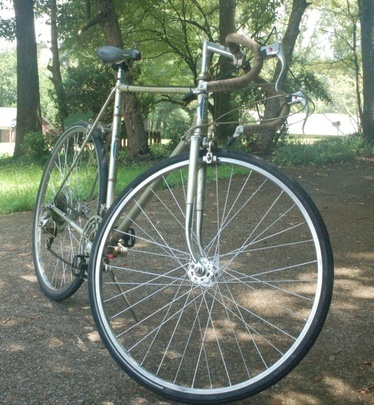 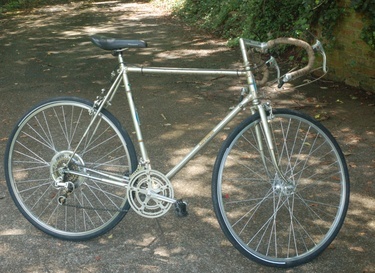 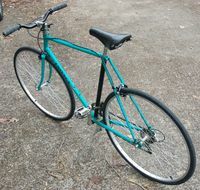 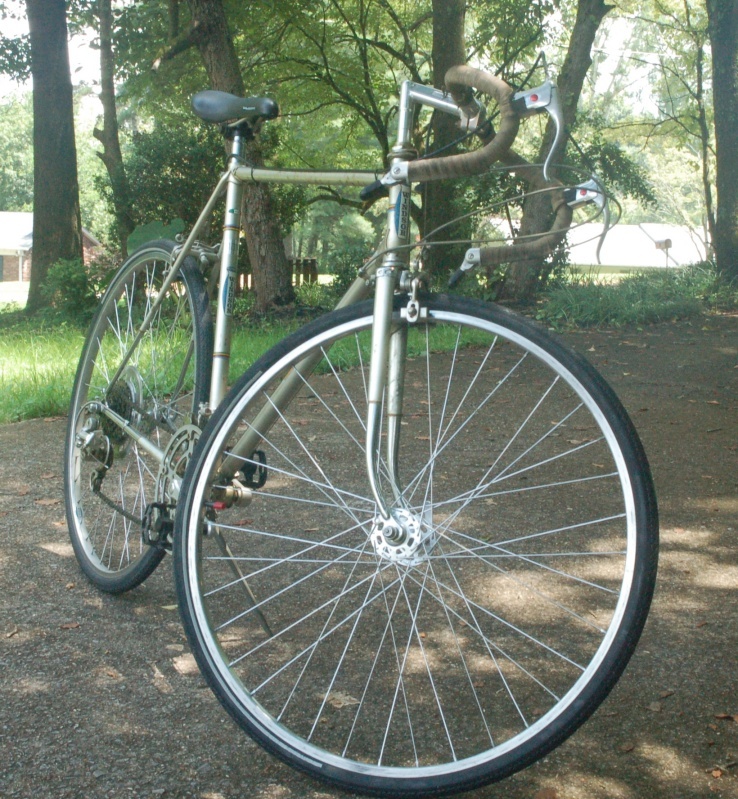 This is a nice, simple US-made Schwinn that I am tempted to build a cool, "city bike" style bike out of. The running gear is all good. 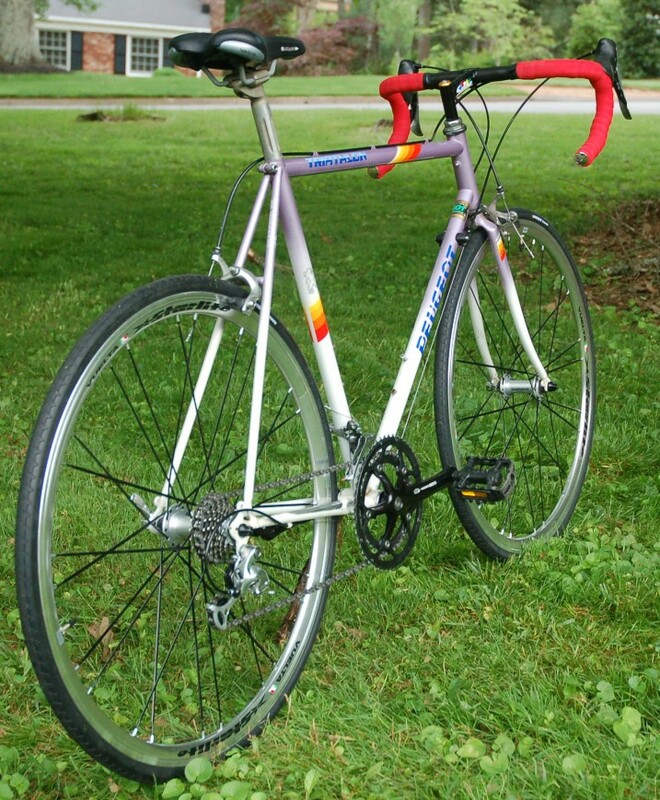 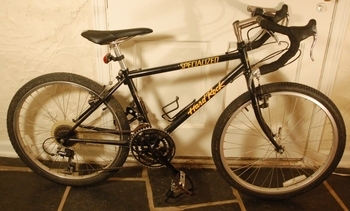 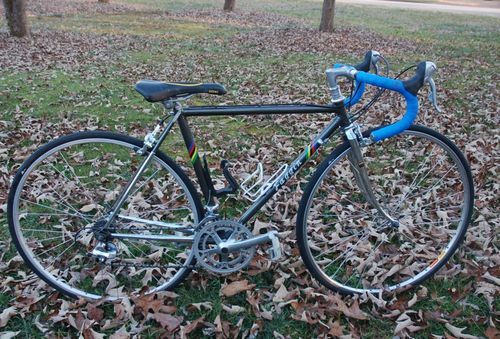 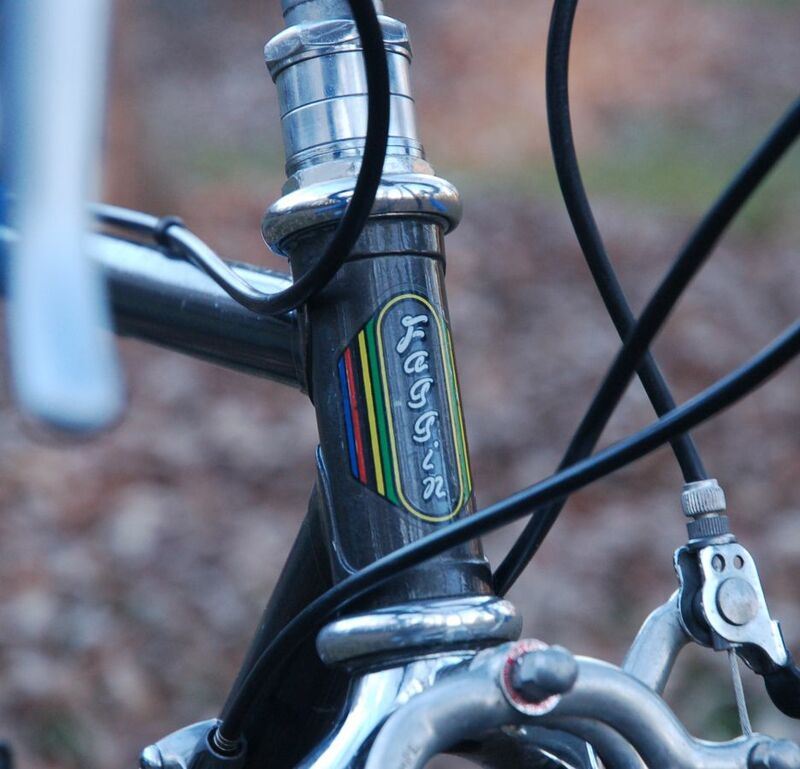 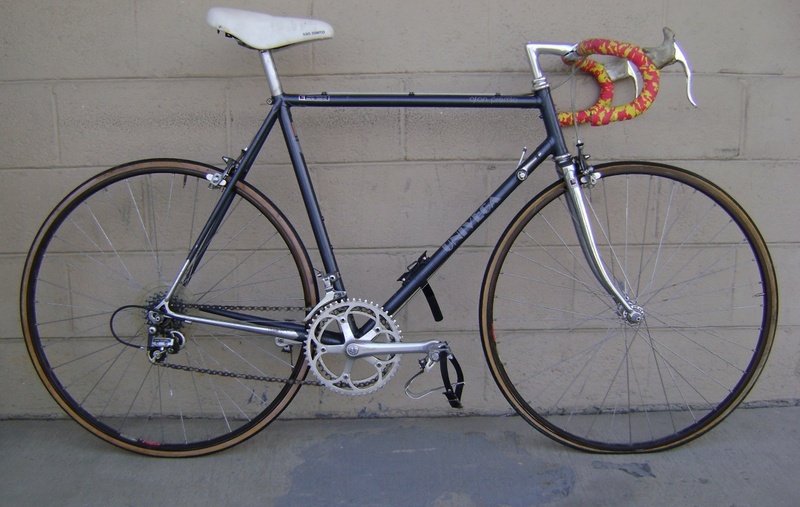 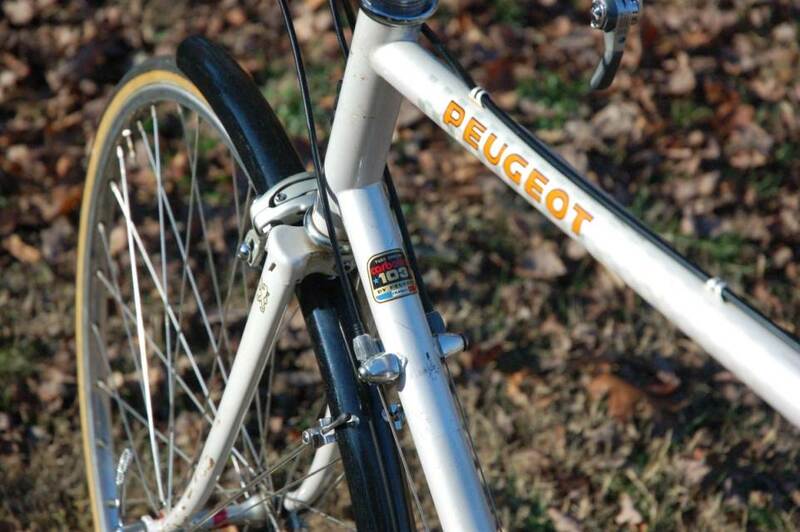 I have a feeling that some of this bike was grafted with a Peugeot at some point in time because it has Hueret detrailleurs (as opposed to SIS Shimano, which I believe would have been correct for '87), a Stronglight crankset and French Rigida 27" aluminum rims. 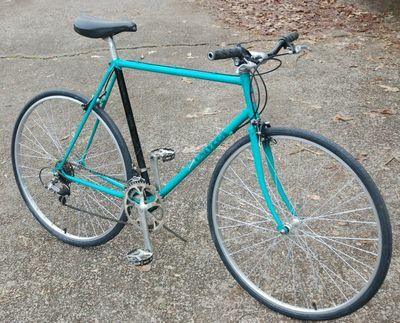 In it's current state, it's a few cm too small for me, but I am thinking with stem, bar and seatpost changes it could be a great upright greenway cruiser. 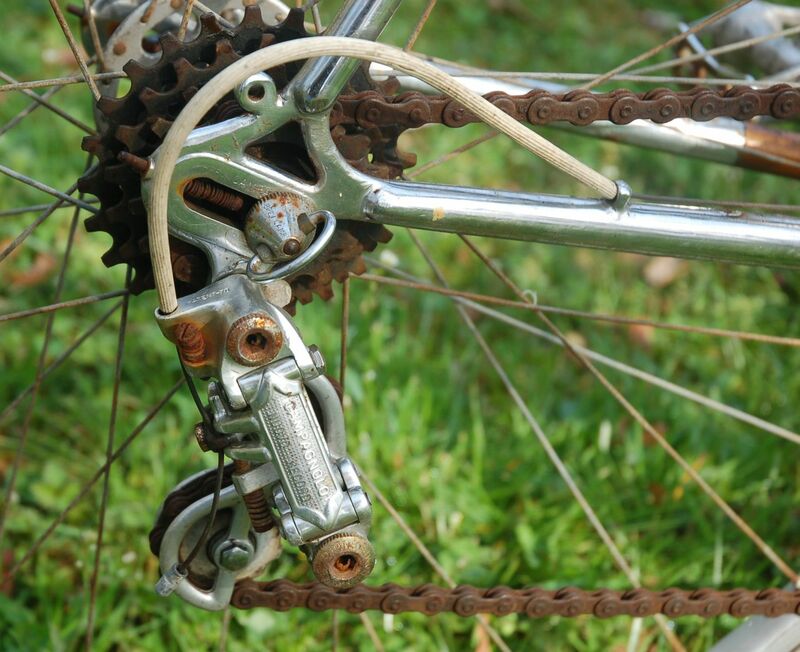 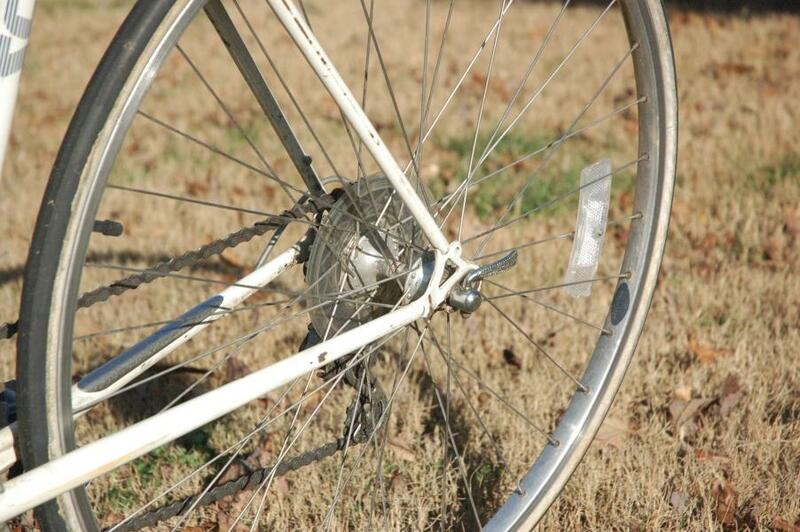 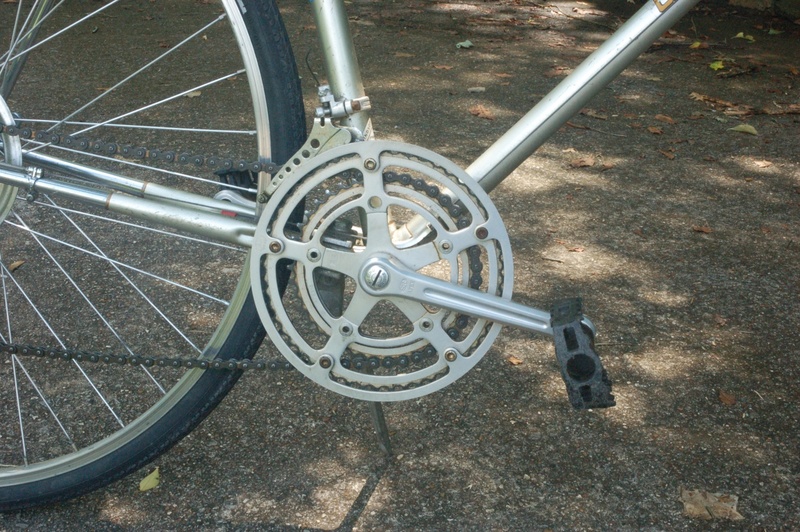 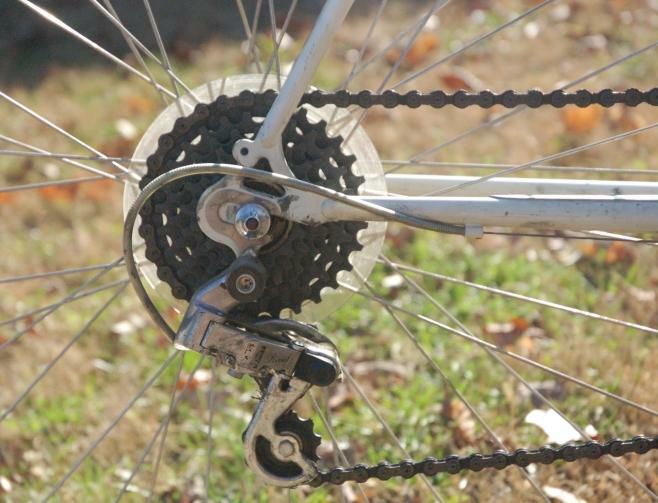 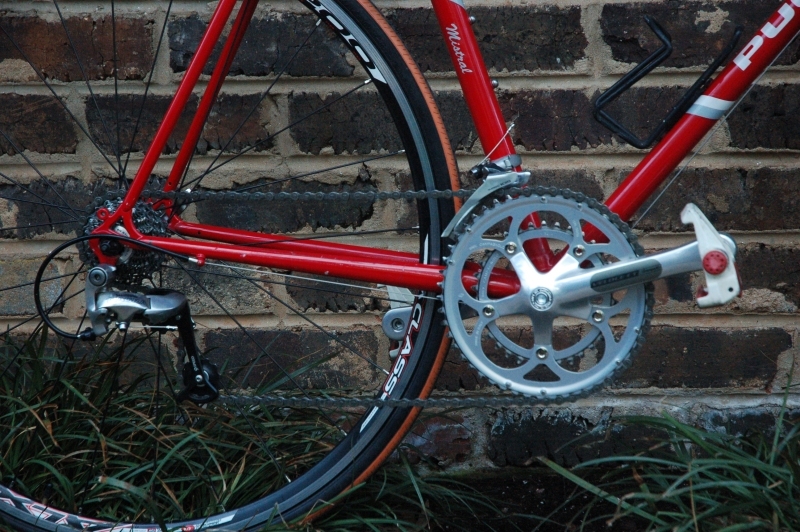 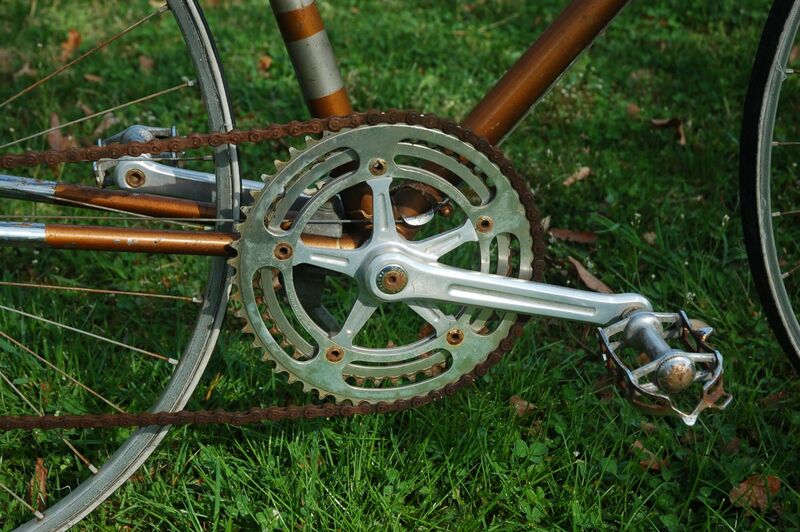 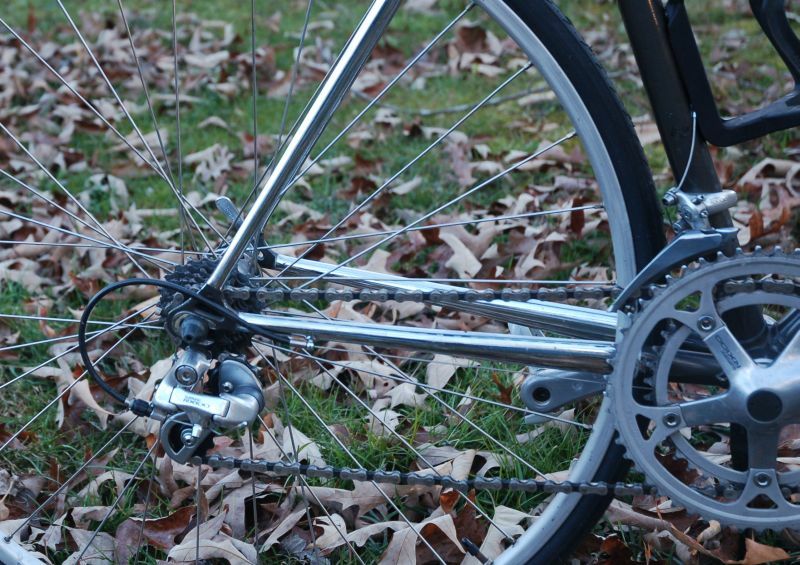 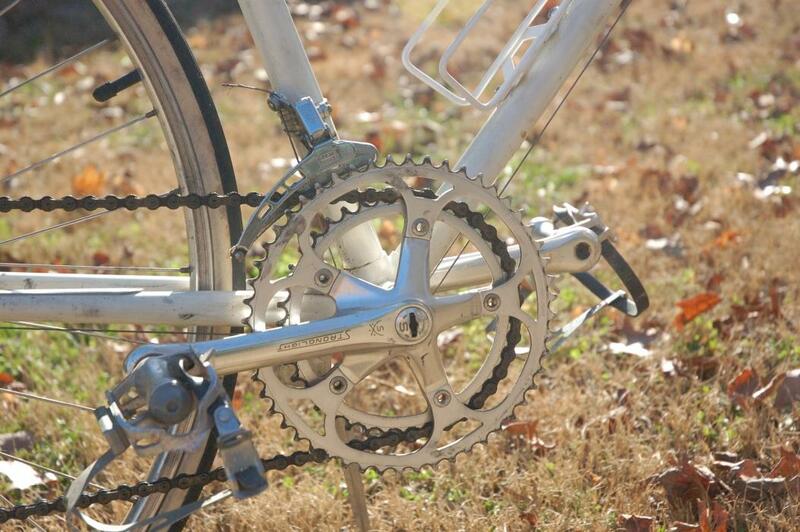 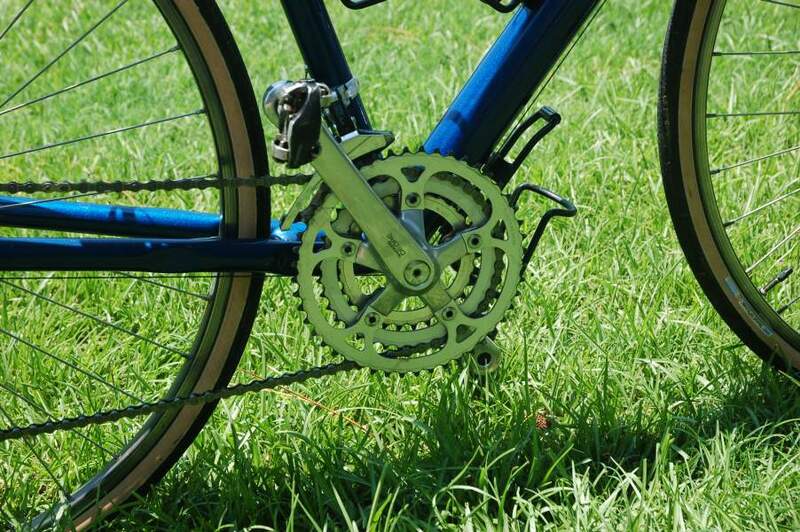 The original drivetrain remains on this bike. 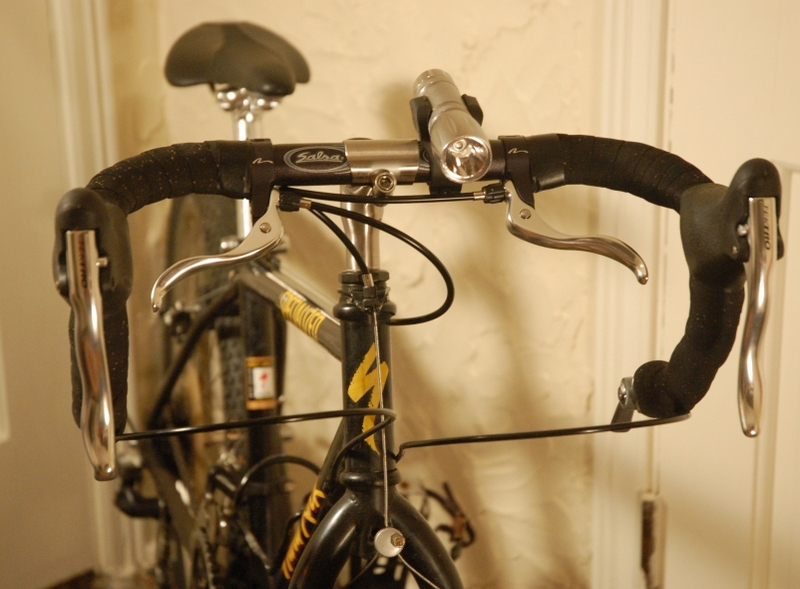 I changed the handlebars for mustache style bars and installed Suntour ratcheting bar end shifters. 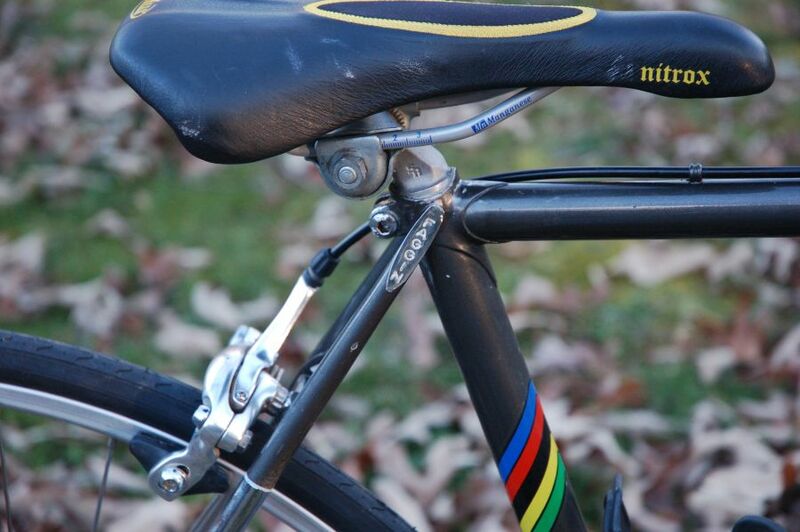 The seatpost was replaced for something longer and a new take-off seat gifted from a friend was installed on it. 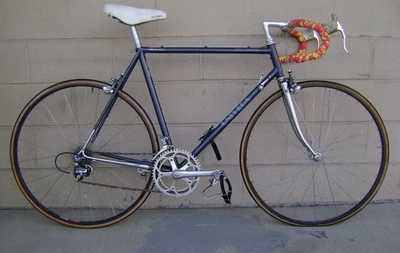 I used a set of aero brake levers (circa late 80s) paired to a set of 105 dual pivot brake calipers also of a late '80s/early '90s vintage. 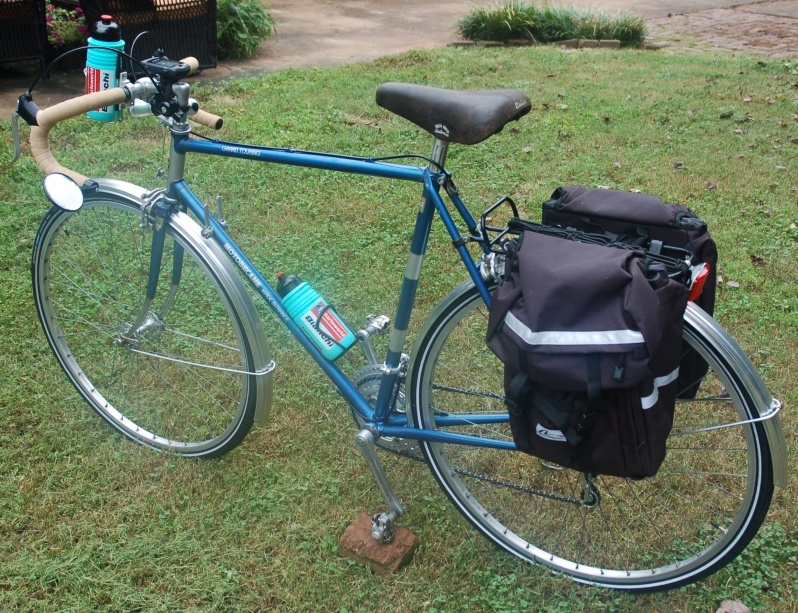 I added the rear rack and usually run some type of SPD pedals. 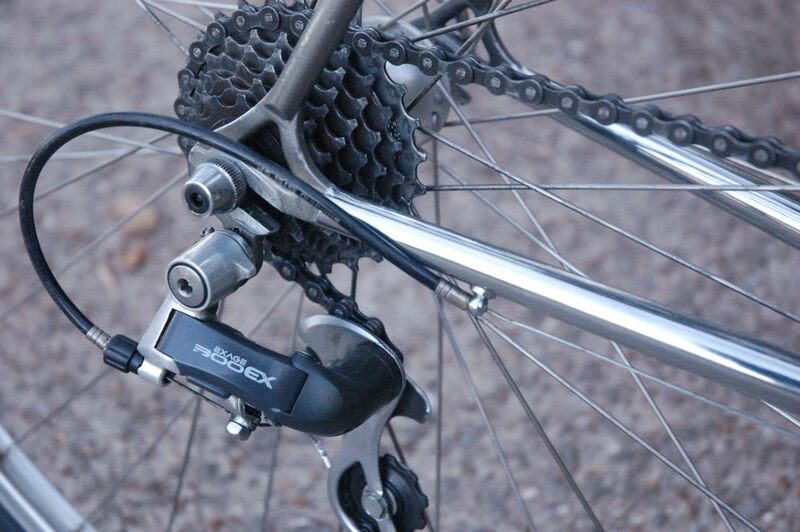 It got new cables, re-lubed bearings and the usual fare of "clean up" work you would expect. 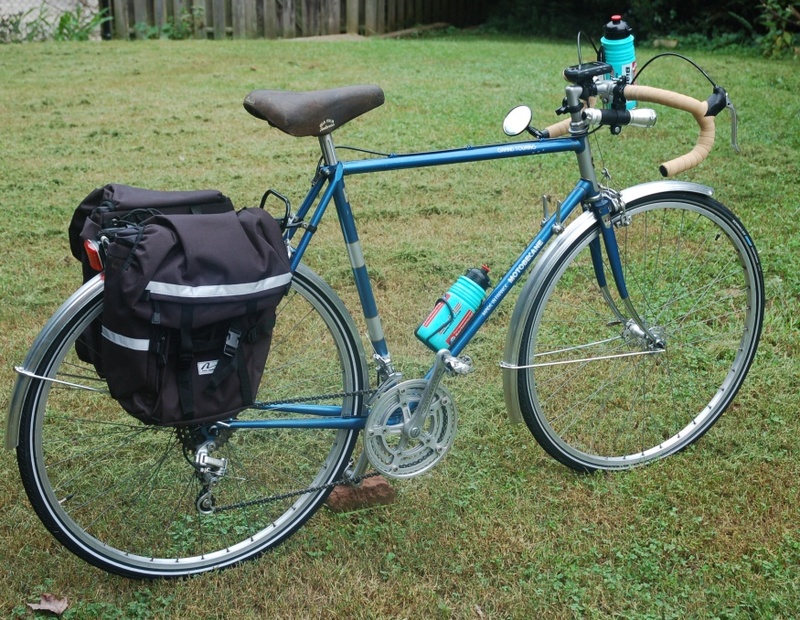 It makes a very nice urban bike that isn't bad at all to log 30+ miles at a time. 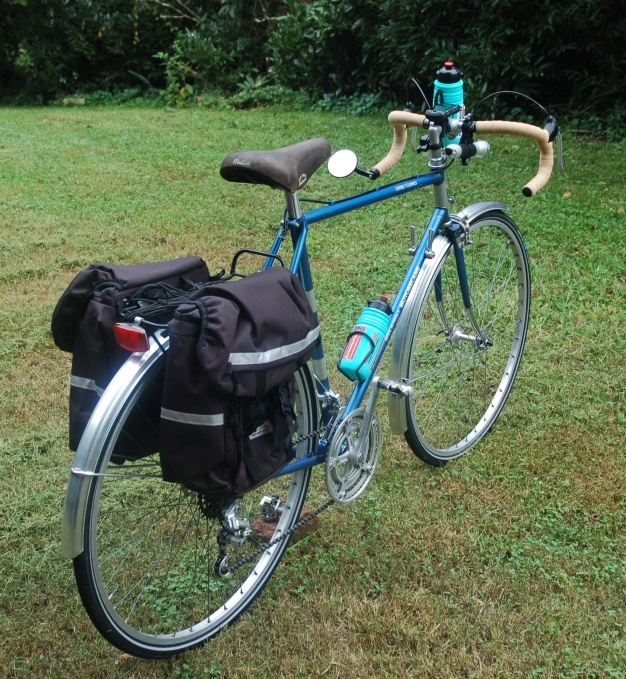 I am hopeful the 27" Rigida wheels hold out. 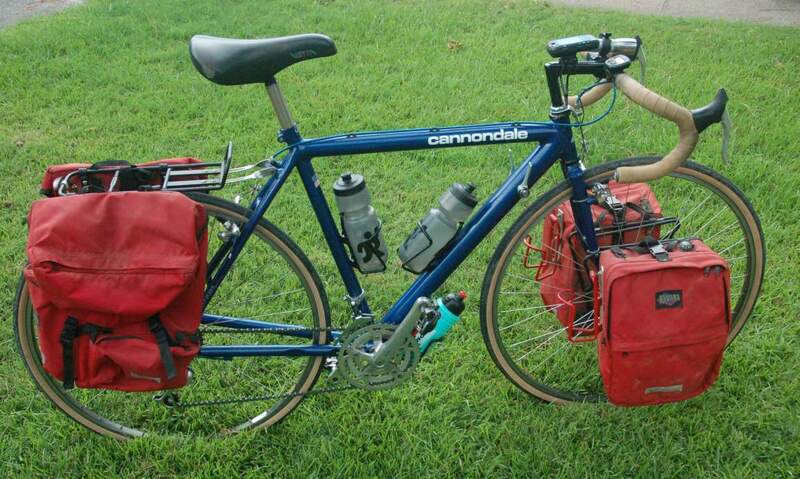 I was lucky to find a pair of virtually new, good tires for the bike from the local Craigslist for $5 for the pair. 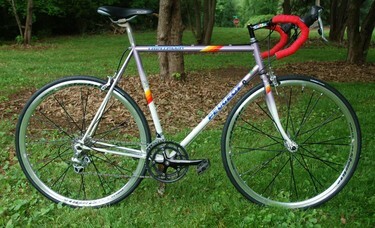 I am sure this bike will continue to evolve. In fact, it has already evolved a little bit since these photos were taken! 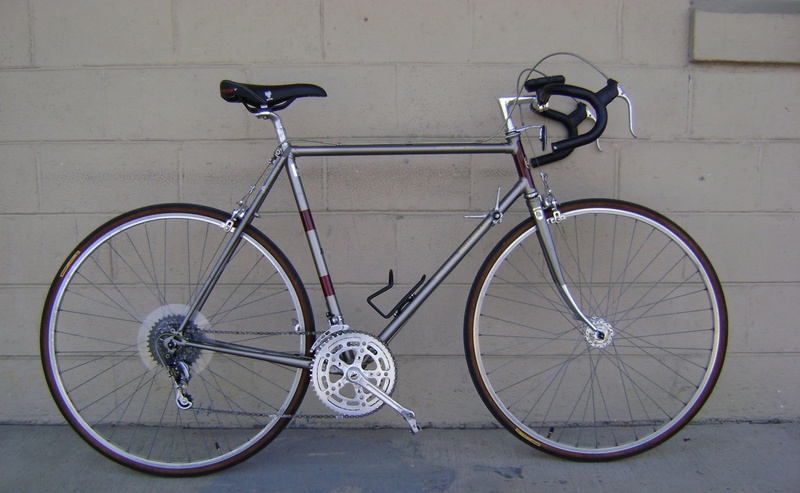 This turned out to be a rather slow and randomly accessed (ie, done in bits & pieces here & there...with bits & pieces from here & there) project, but I have almost completed Phoenixing the 1982 P8 Carbolite bike into a nice, sturdy urban commuter (or tourer) bike. 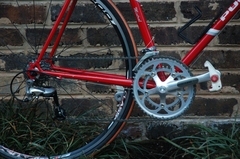 This was done using take-off parts mostly, along with some Ebay bargains. The wheels migrated from the PSV10, since they were 700c, aluminum, 7 speed rear, and generally in alright condition. The handlebar was swapped with an aluminum drop bar that came attached to a stem I needed for Elliot's bike and the Shimano 105 derailleurs and brakes were all random spares from Ebay. 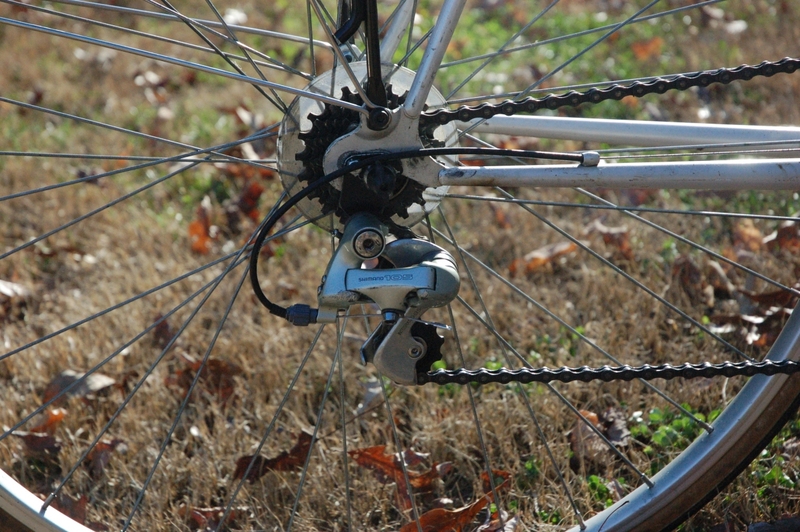 Mounting modern brakes with recessed bolts required some minor drilling (one side) of the brake bridge and upper fork to accomodate post-1985 style road bike brakes. 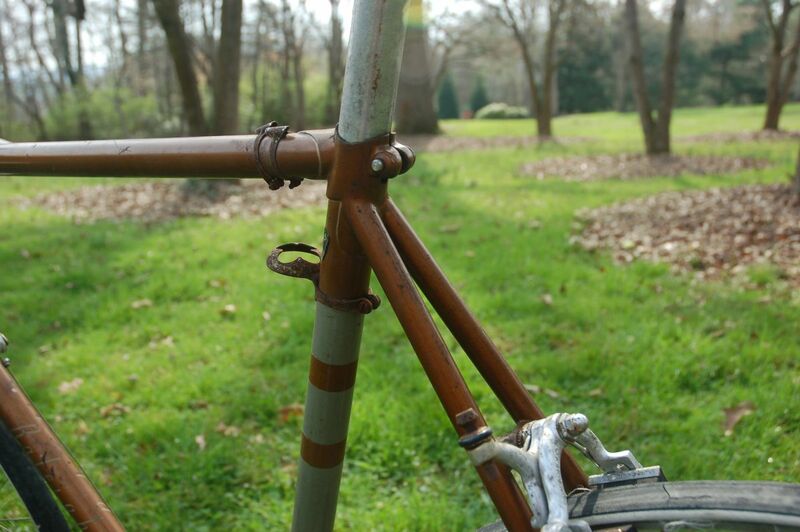 This Carbolite 103 frame is not the finest piece of craftsmanship to ever leave Europe, but on the other hand the geometry is great and it's probably unbreakable to the same extent as you'd imagine a 1965 Schwinn! 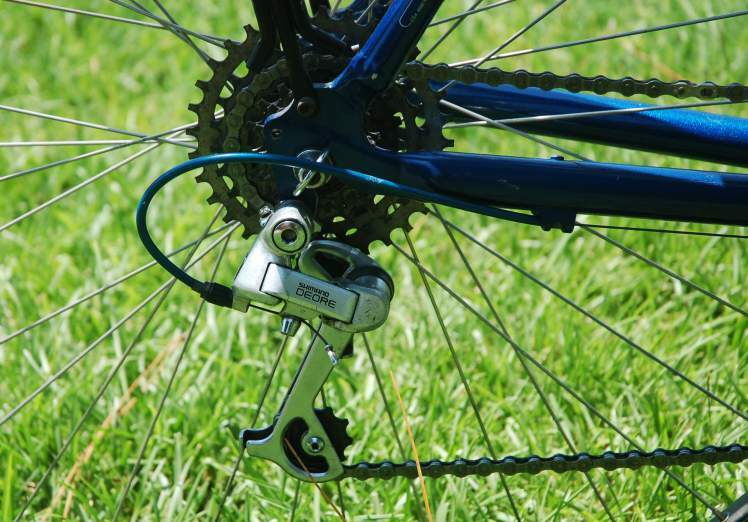 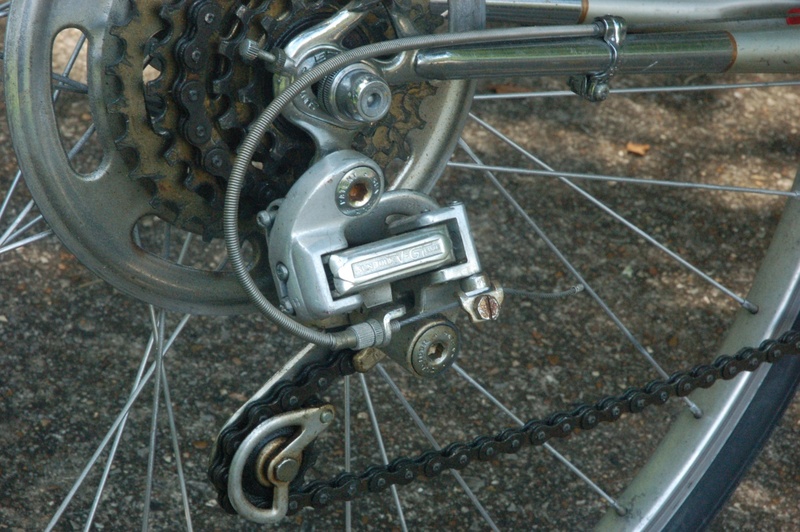 The frame originally did not have a rear derailleur mounting tab, but rather incorporated an adaptor as part of the original derailleur. I modified this adaptor by tapping it to fit the 105 derailleur and grinding/welding the metal to mate correctly to the tensioner mechanism. 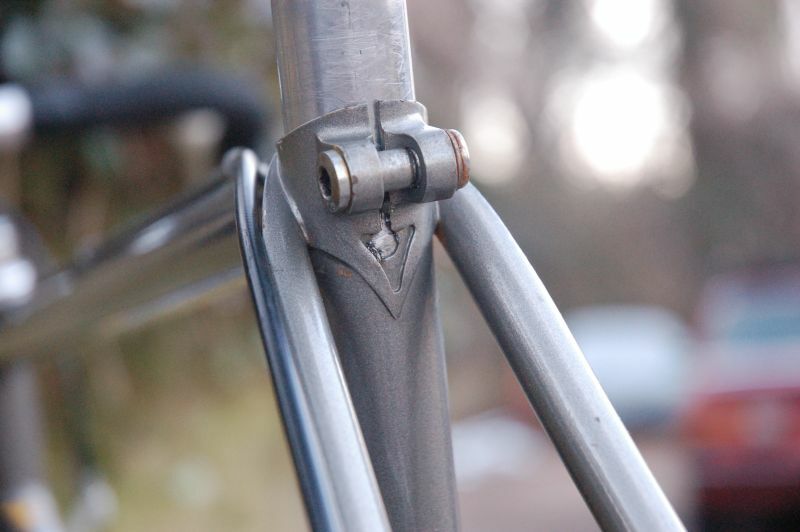 Ultimately, this turned out nicely, though having to do such work may be the first clue to move to another frame for someone who doesn't have access to basic machining tools & a welder. 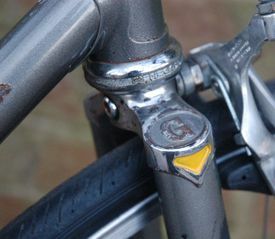 The brake levers are Shimano 105 and the bar end shifters are Shimano ultegra (currently set on friction). 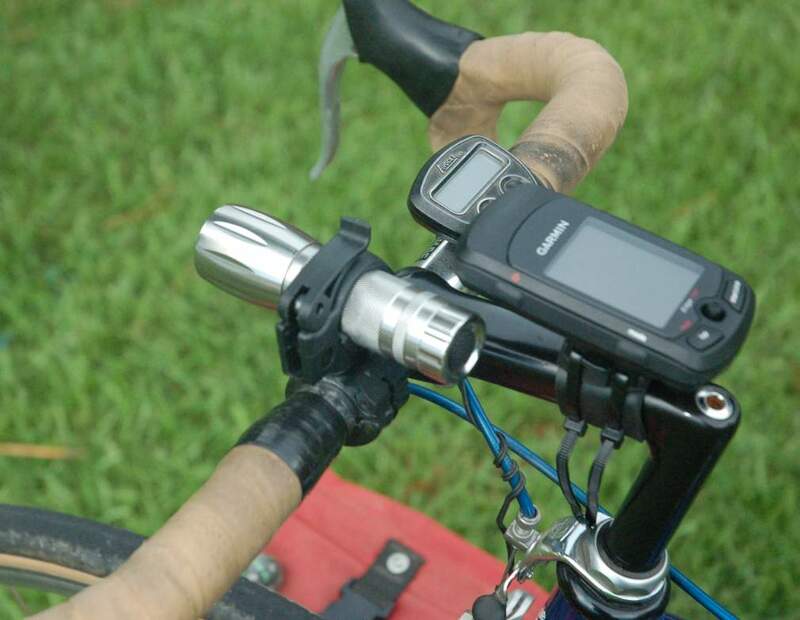 I have not tried the light out in truly dark situations, but this is the Cree LED Lowe's Task Force flashlight that was recently highly acclaimed as the best bargain on a bright bike light. 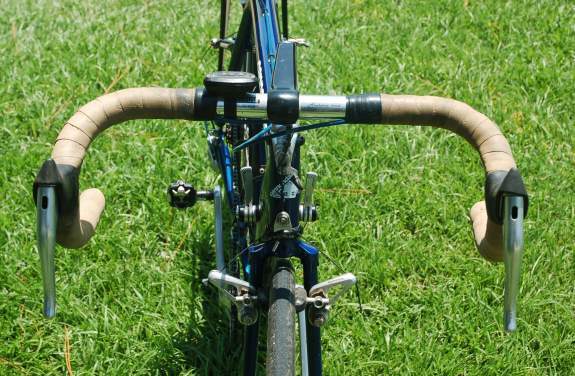 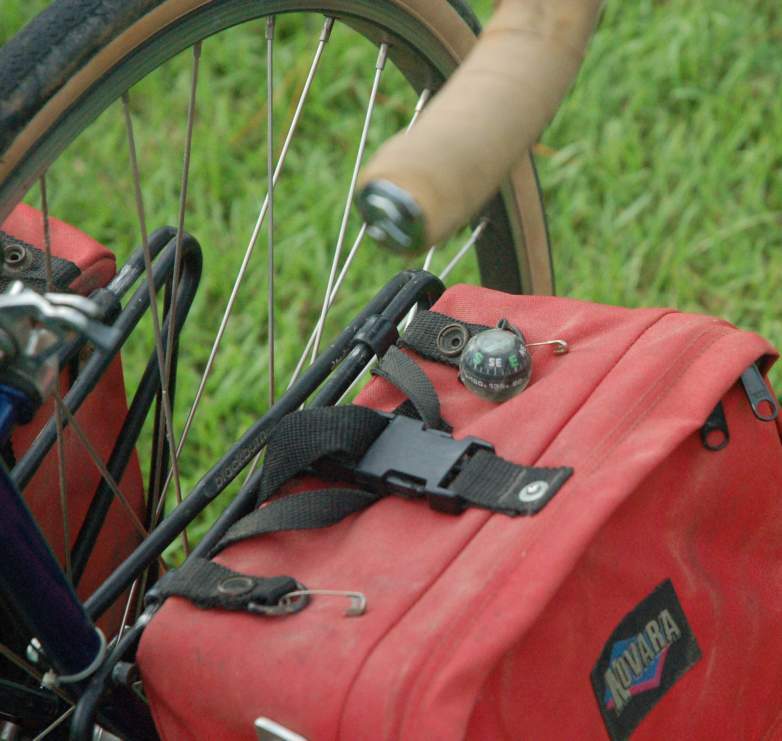 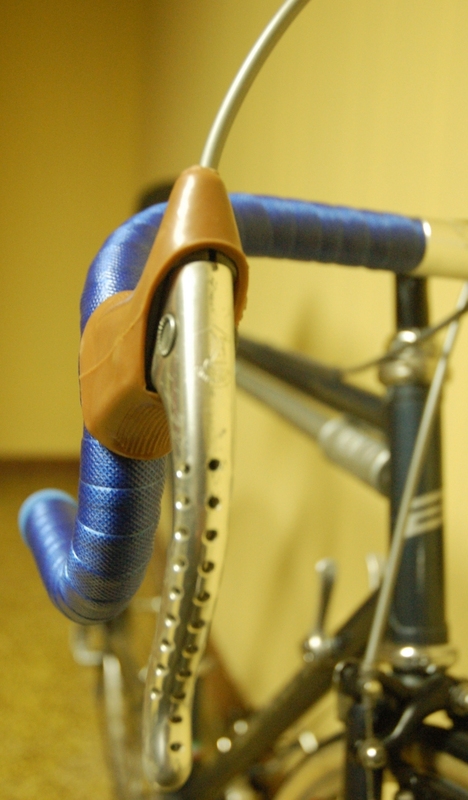 The saddle is a vintage suede Turbo saddle from the 1980s. Not sure the year model, but this is a Bertoni Nuovitalia, with Columbus Matrix tubing and a mix of Shimano 600 and Campy components. 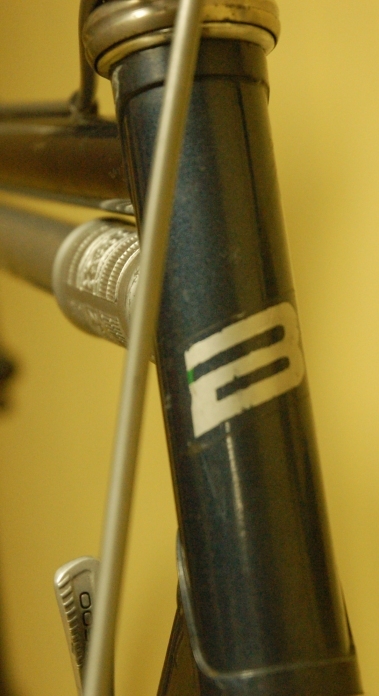 It should be from some time between 1986-1988. I'm still researching this marque and the models. This is the same size as the Bertoni Professionale, but there are a number of subtle and not-so-subtle frame construction differences. 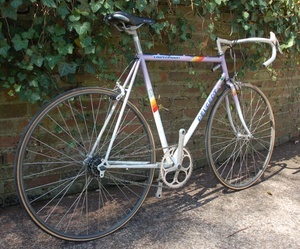 Still, to me it's a beautiful machine and it appears to be quite original in its current state. 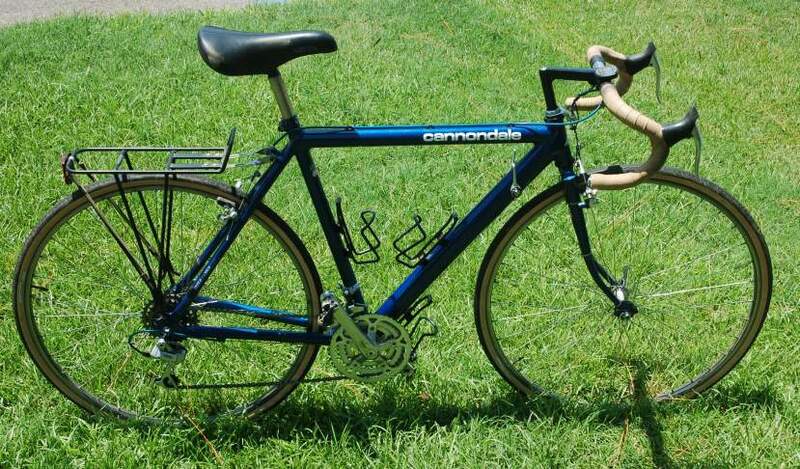 Of course, the challenge will be for me to see if I can resist giving it a few modern amenities....well, or maybe which ones to give it....or....well, for now, it's almost a time capsule to the '80s. 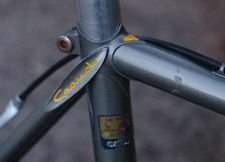 What's different on the bike is now it has the Cinelli bars original to my Bertoni Professionale (probably need to have a good angle shot to get a sense of these...not much flat area on top with these..made for hammering in the drops! 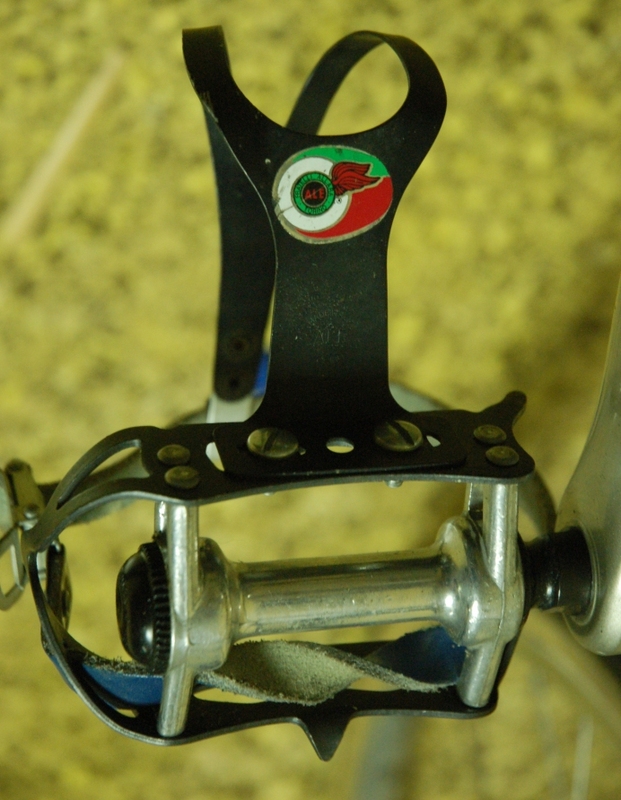 ), Tektro brake levers (very practical Campy hood copies, imho), new brake cables and housings, new Campy Veloce brake calipers. 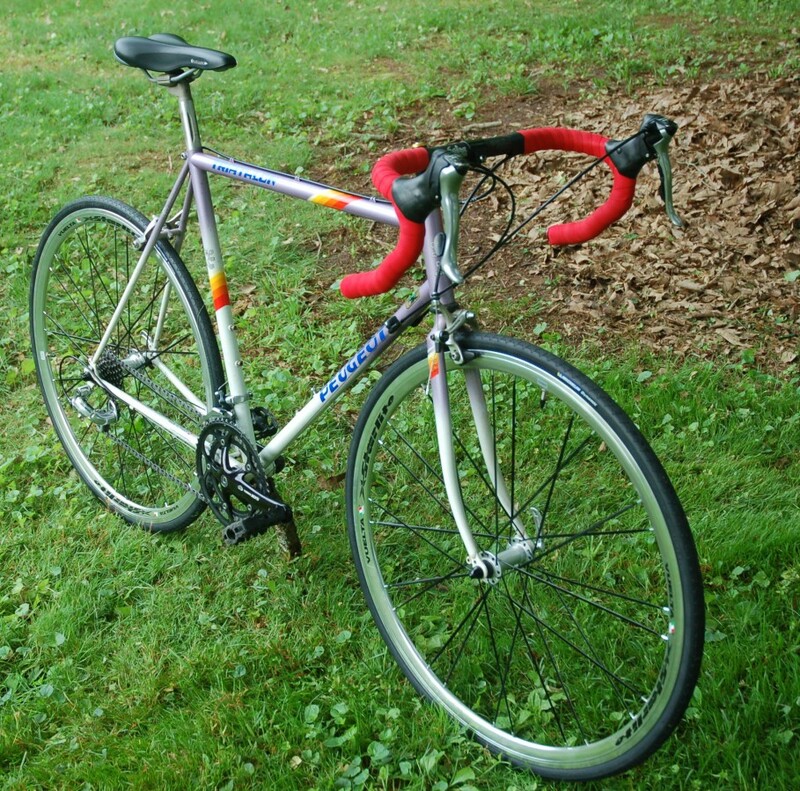 Since the photo was taken, I have also replaced the Columbus stickers that has been scratched off when I got the bike.